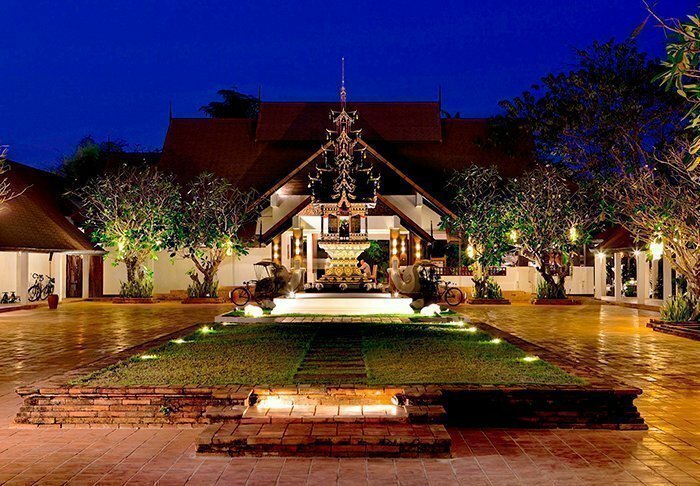 Here, you can find out more about the hotels that we use during our tours to Thailand. 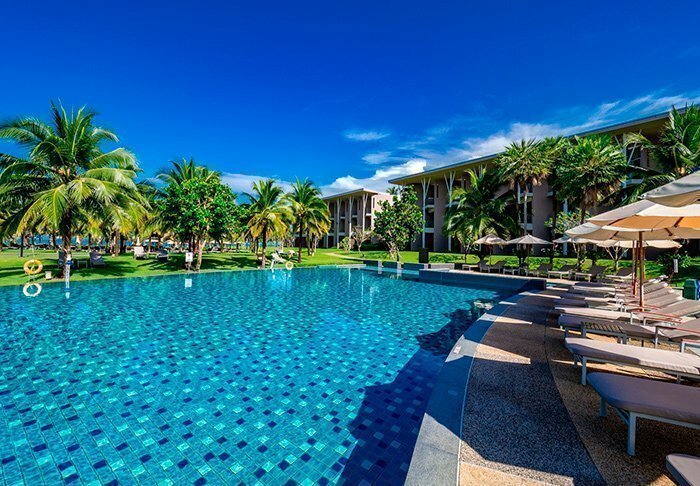 Aonang Princeville Resort & Spa is like a quiet green oasis, situated along the lively beach promenade and main street with all its shops and restaurants. 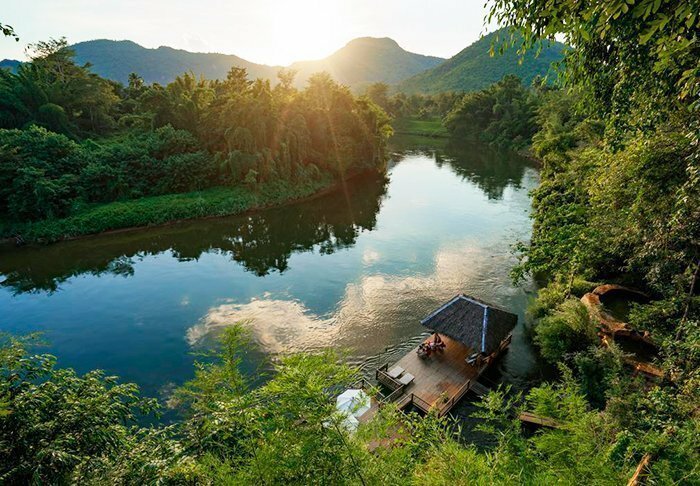 At the beach, which is just a stone’s throw away, you will see countless longtail boats whisking backwards and forwards between Aonang and Railey. 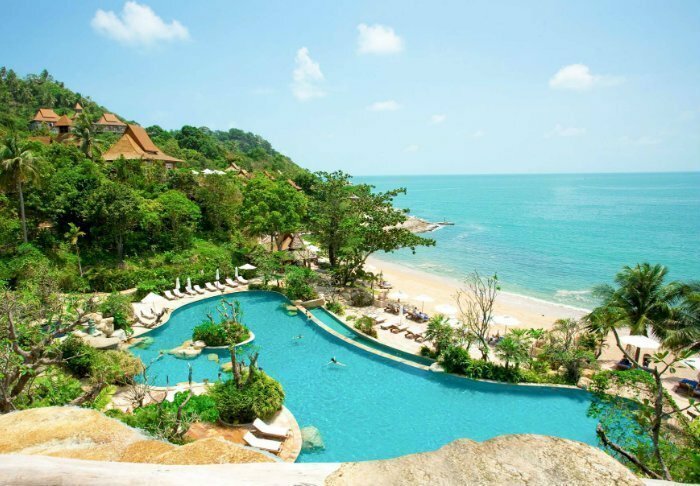 The beach offers beautiful views of the Andaman Sea and the vertical limestone mountains. 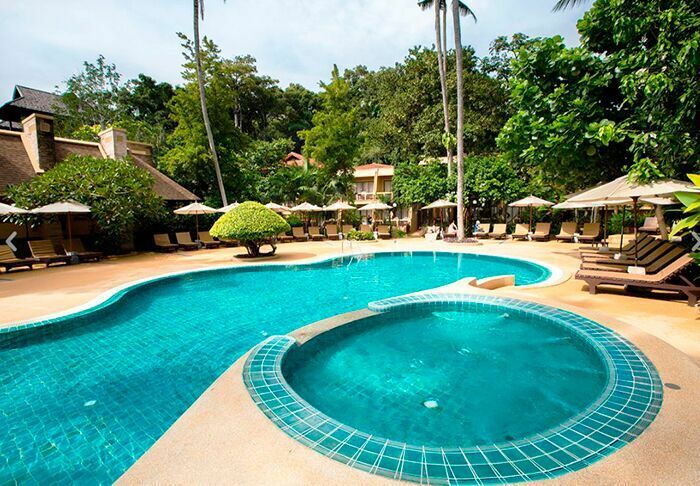 where you will find the swimming pool, a children’s pool and sun loungers. If you fancy a spot of pampering, you can book an appointment for a nice, relaxing massage at the resort’s day spa. 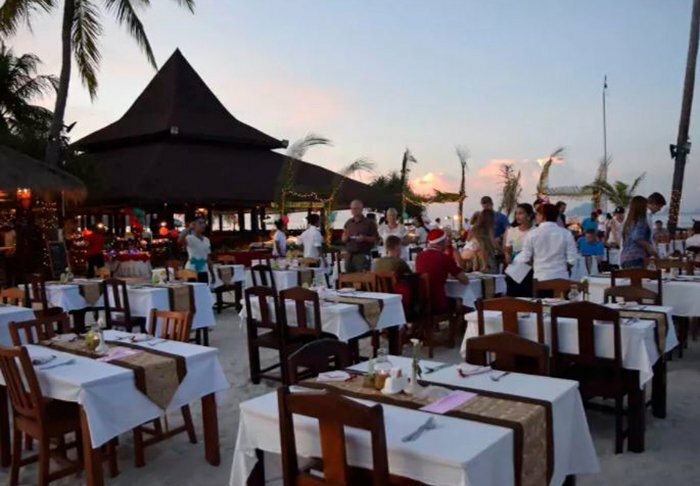 The resort also has a small café and restaurant where local and international dishes are served. Round off your day with a stroll along the beach to catch the magnificent sunset. 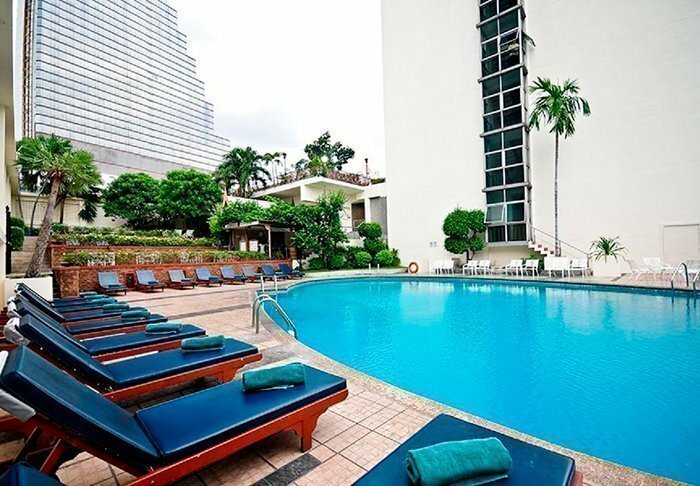 Narai Hotel is located in the heart of Bangkok’s main financial district and night-life hub, Silom Road. 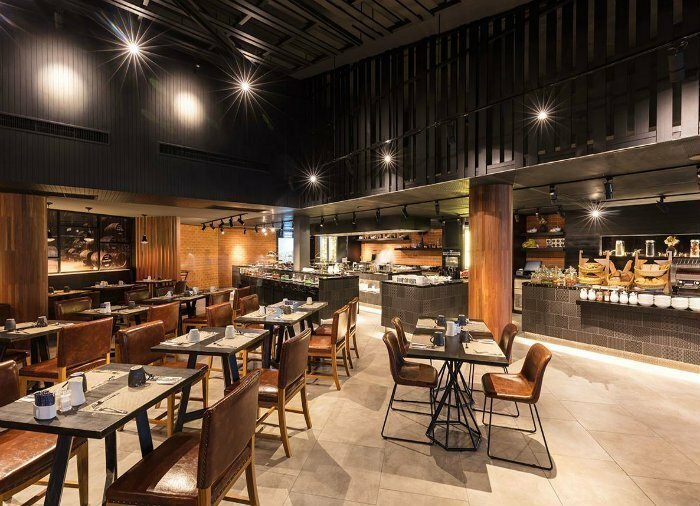 A few steps away from the hotel is the street Silom Soi 20, where you can enjoy local Thai dishes, and Mama’s Kitchen is definitely worth a visit. And a couple of streets away from here, you will find the pleasant Silom Village offering restaurants, shops and entertainment. Near the hotel, you will also find good shopping, cash machines, pharmacies, etc. 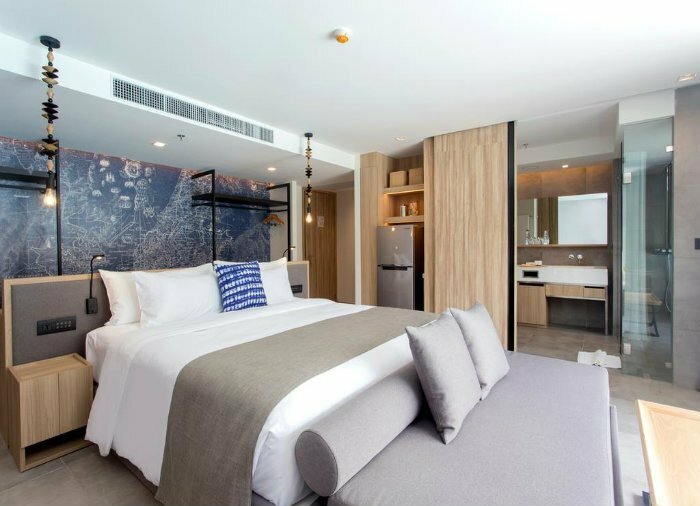 You are around a 10-minute walk from a Skytrain station and approximately 15 minutes from Bangkok’s night market, Patpong. 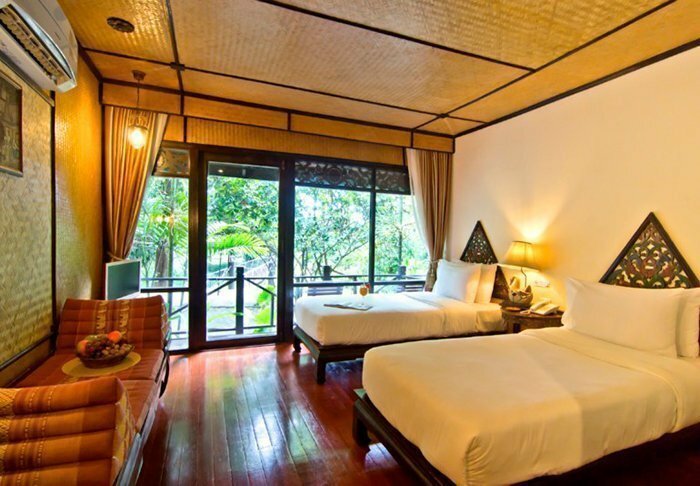 Narai has 475 spacious and modernly appointed rooms with air conditioning, Wi-Fi, TV, telephone, radio, minibar, safe and hairdryer. The hotel also has a gym, pool, lounge and two restaurants where you can enjoy Italian dishes and an international buffet. 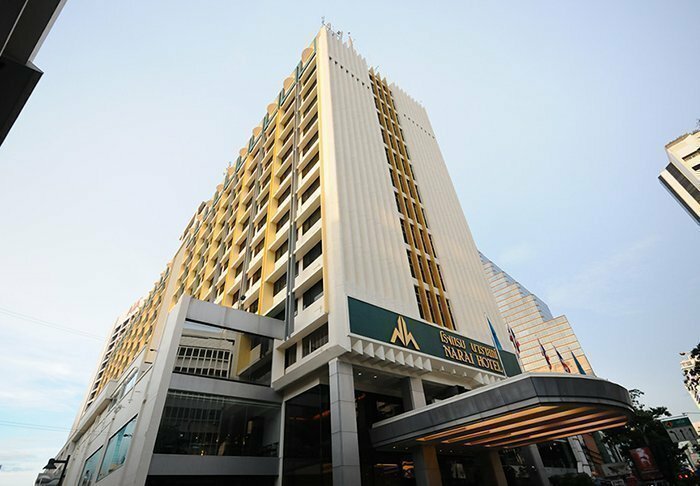 The 4-star hotel Triple Two Silon is located directly on Silom Road, Bangkok’s most important commercial street, about 25 km from the airport. 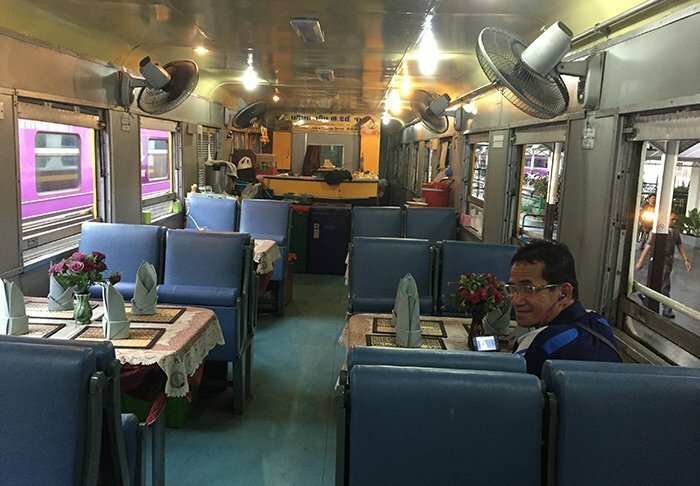 Here you can find a wealth of excellent shops, restaurants and street kitchens just outside the hotel, up close to the Chong Nonsi BTS Skytrain Station. 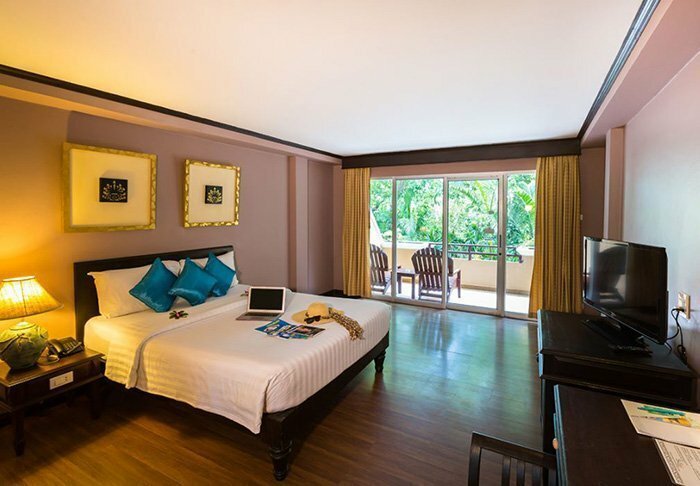 The hotel has 75 delightful, spacious rooms with modern and luxurious interiors. 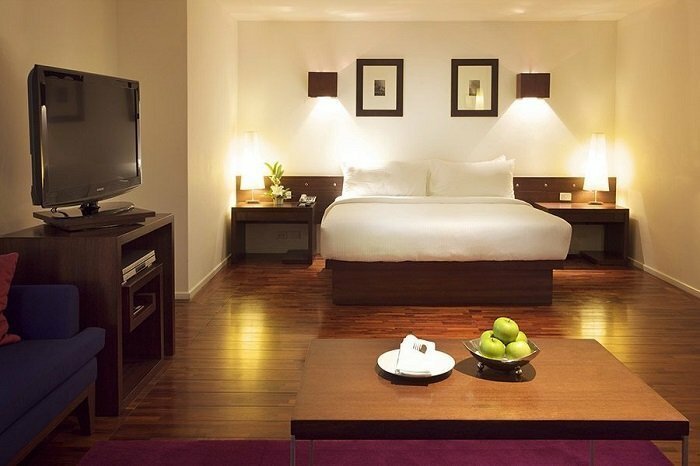 All rooms have air conditioning, a mini-fridge with a minibar, flat screen TV with pay TV and Wi-Fi, hair dryer and bath robes. The hotel has a restaurant and a lounge bar. 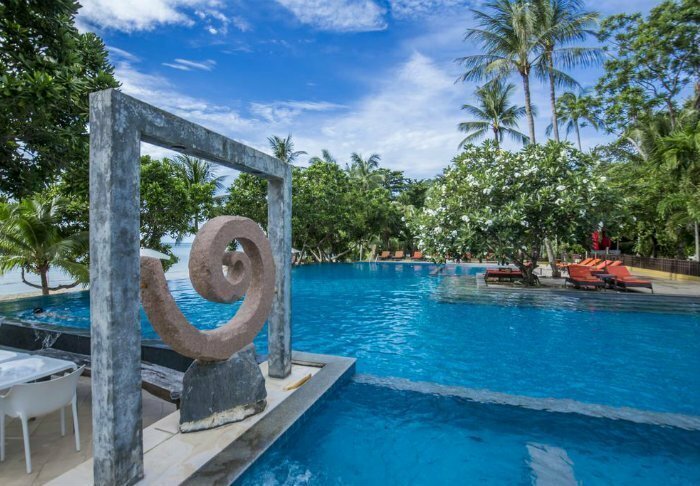 As a guest, you can make use of the outdoor pool and the fitness centre at the sister hotel, Narai Hotel, which is just next door. 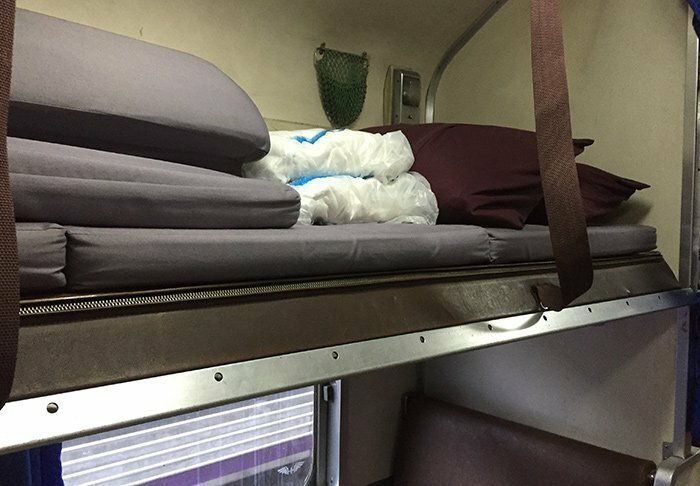 Overnight accommodation in a sleeper seat on the night train from Bangkok to Chiang Mai. 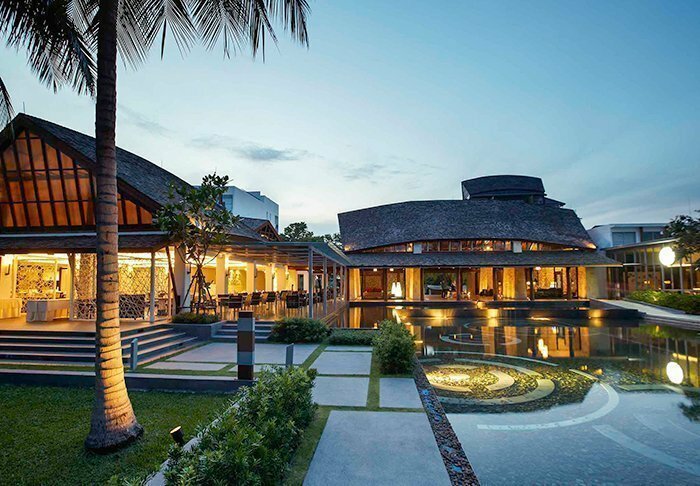 The luxurious Veranda Resort & Spa is a 2½-hour drive from Bangkok and enjoys a great location leading down to the hotel’s private beach. 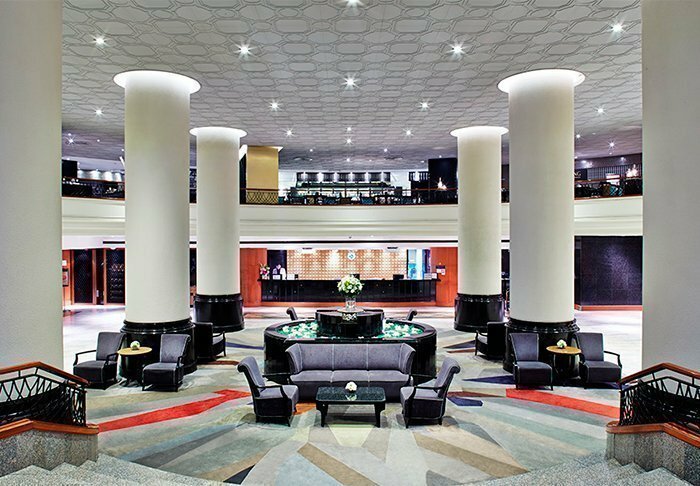 From the moment you enter the rustic lobby, you will be overwhelmed by this 4-star hotel, which has a welcoming, contemporary design. The hotel’s 60 deluxe rooms are 44 m2 and are equipped with Wi-Fi, air conditioning, safe, mini bar, TV, telephone, tea and coffee-making facilities and a fabulous bathroom with hairdryer, rain shower, separate bathtub, bathrobe and slippers. 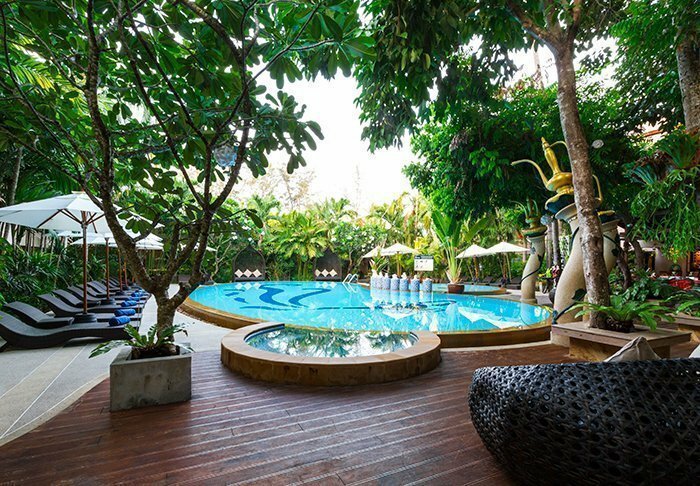 Morning and evenings can be enjoyed on the balcony, overlooking the Feng Shui garden with its tropical palm trees and evergreen trees. 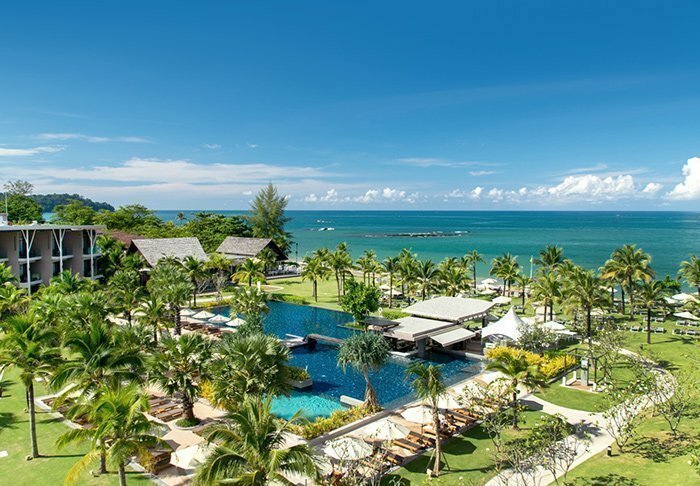 If you’re not into the beach, you can take a dip in the exclusive infinity pool overlooking the sea or just chill on a sun lounger with a good book in the shade of a palm tree. You can also enjoy a drink or snack from the poolside bar. Need a spot of pampering? Visit the day spa for a massage or a facial. For those who like to maintain their fitness routine on holiday, there is also an air-conditioned gym. 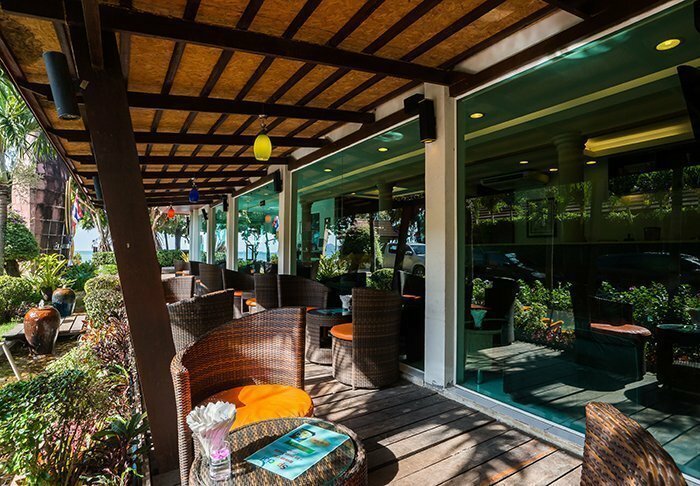 The restaurant serves both Thai and Western dishes, which can be enjoyed both indoors and al fresco. 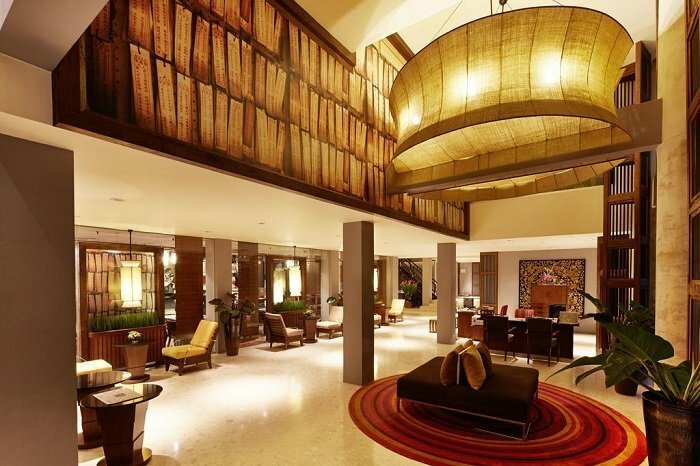 Additional amenities include a children’s club, an espresso bar and an excursion desk. As the perfect end to a fantastic day, take a walk along the beach to the sound of the waves lapping. 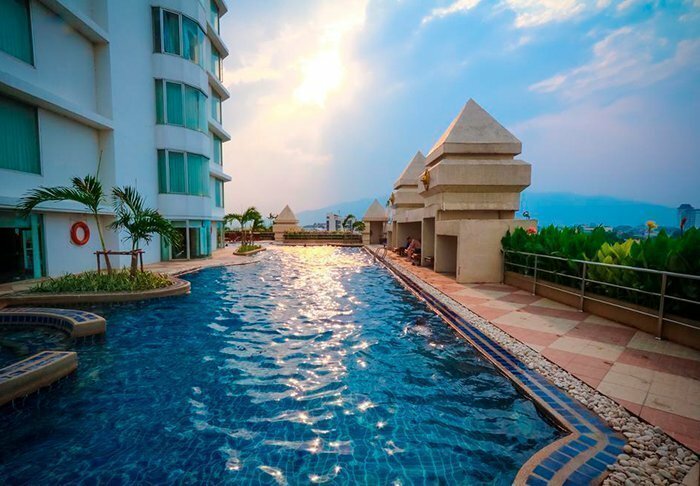 Duangtawan Hotel enjoys a wonderful location overlooking the city and the surrounding mountains where you can watch the sun set. 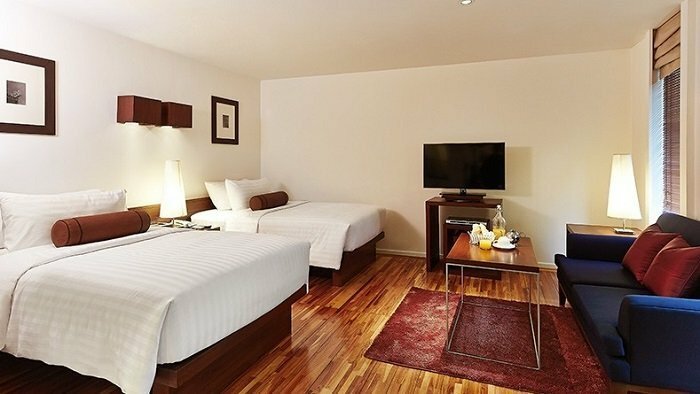 The hotel is within walking distance of the city’s night market and just 15 minutes from the airport and the train station. 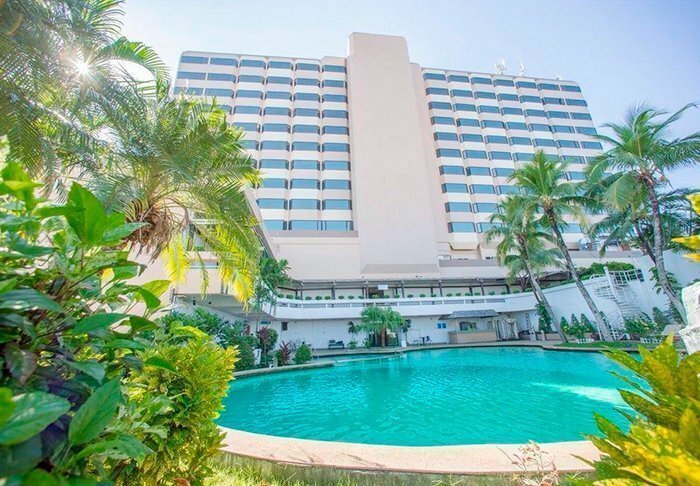 Duangtawan Hotel has a total of 515 spacious rooms spread over 24 floors, all with air conditioning, Wi-Fi, TV, mini bar, safe and hair dryer. 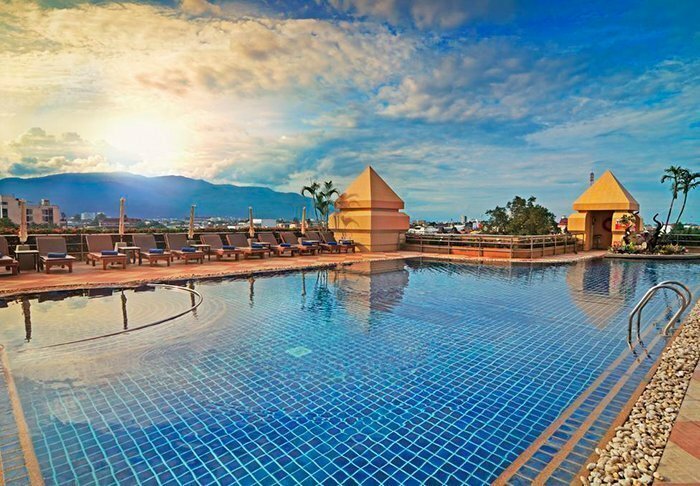 After a day of adventure, you can relax by the hotel pool, from which you can enjoy the panoramic view of Chiang Mai. There is also a day spa and gym. 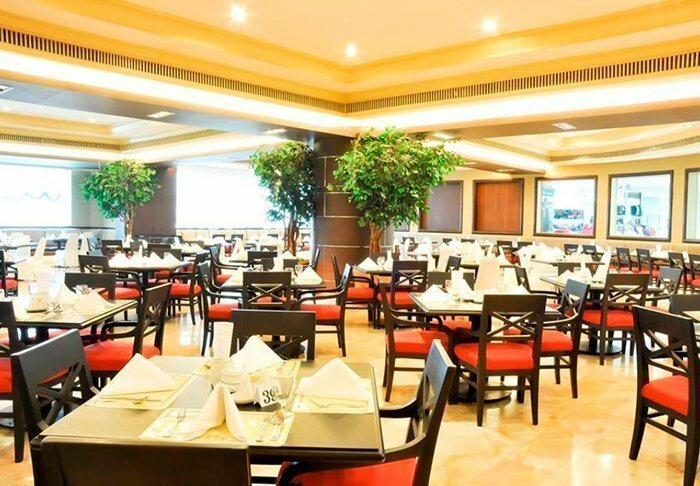 When hunger strikes, you have a choice of the hotel’s restaurants, where you can enjoy Italian and Chinese specialities as well as an international buffet. 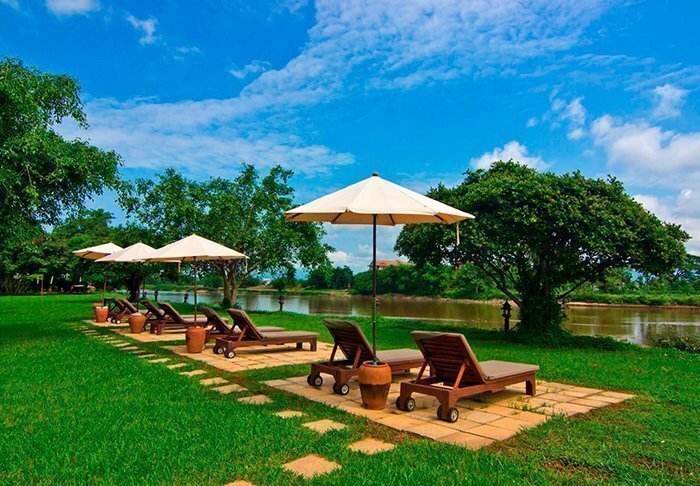 The spectacular Legend hotel in Chiang Rai has a fantastic location down by the river Mae Kok. Here you are surrounded by vast, green, grassy fields, the refreshing breeze from the river and the mountains in the background. 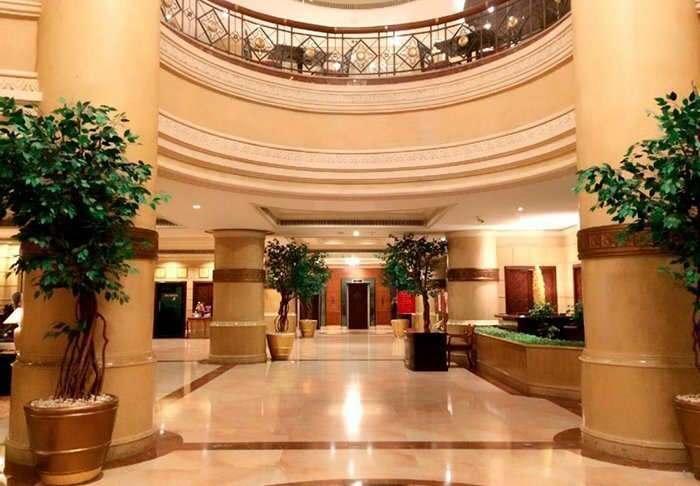 The hotel is only a few minutes’ drive from the city centre and will offer to arrange cheap transport to, for example, the city’s night market. Legend is built in the Lanna construction style, and stands in beautiful harmony with its surroundings – without making any kind of compromise with regard to comfort. 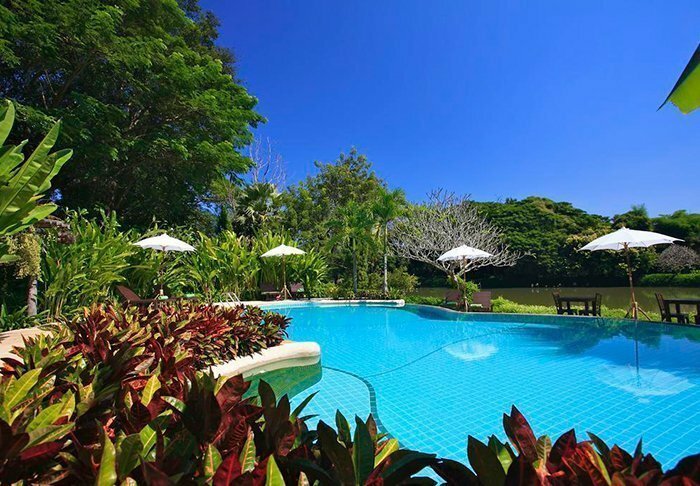 The beautiful infinity pool is tempting after a day of sightseeing, unless you prefer to sit in the shade of a tree and watch the river below. The hotel features a spa area, two restaurants and a good bar. 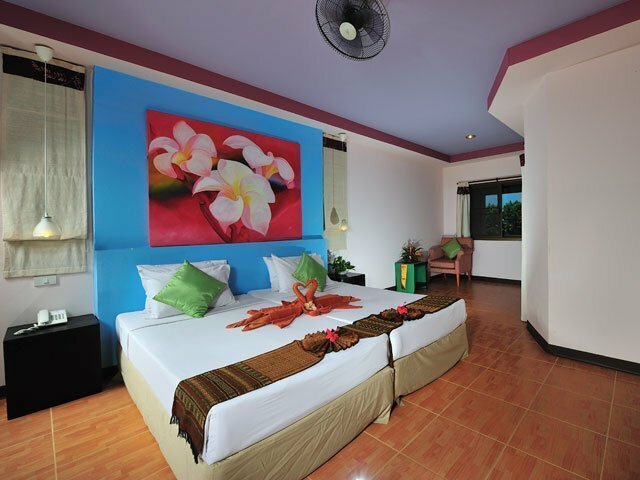 The rooms are big and well-decorated in bright colours. There are large glass sections that can be opened out towards the beautiful garden, and all the rooms have verandas or balconies. 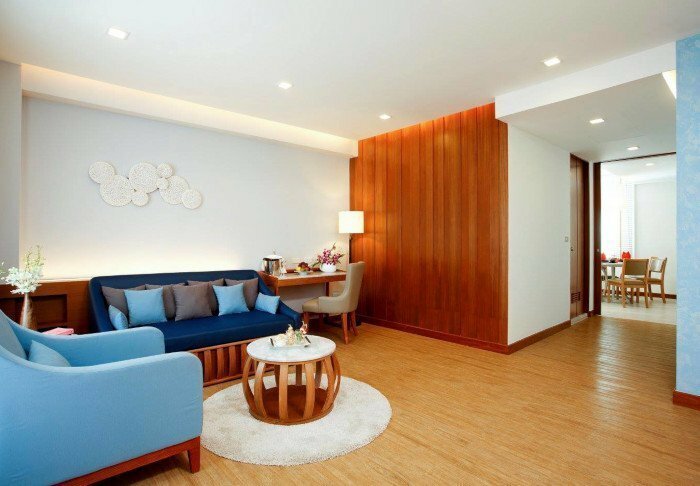 Rooms feature a TV, minibar, tea and coffee facilities, safe, air conditioning and a hair dryer. Wi-Fi is available all over the hotel. 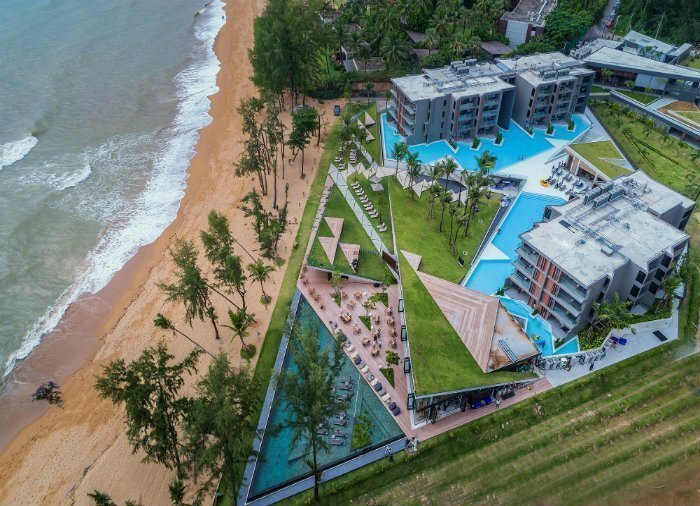 Out towards the beach – yet close to the main street of the small village of Khao Lak, is where this 4-start hotel can be found. 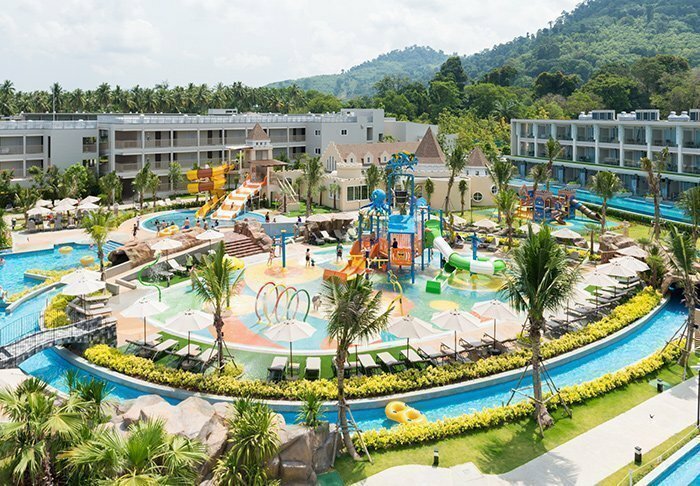 This hotel is particularly family-friendly, offering a wide variety of activity options suited for participants both young and old. 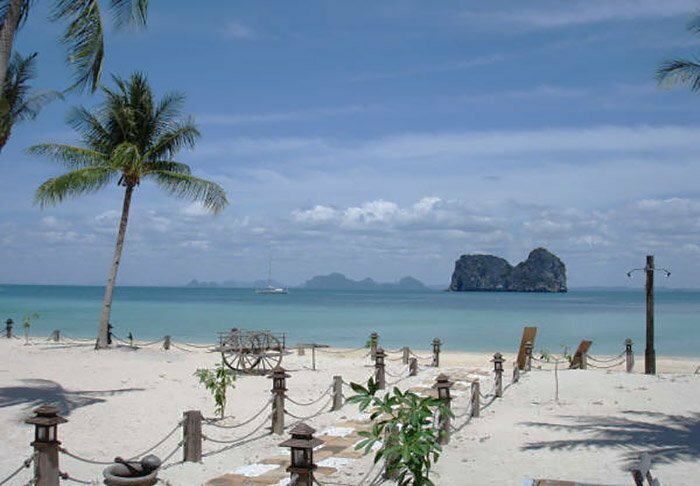 The hotel is just outside of Nang Thong beach and its clear water and nice waves. 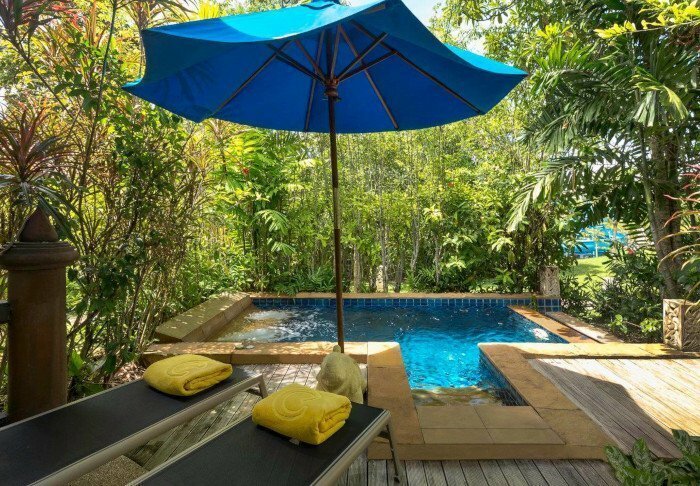 Here you will find a large tropical garden and no less than 4 pools, 2 tennis courts, a squash court, a playground, a kids’ club, water slides – and a splendid spa area, of course. 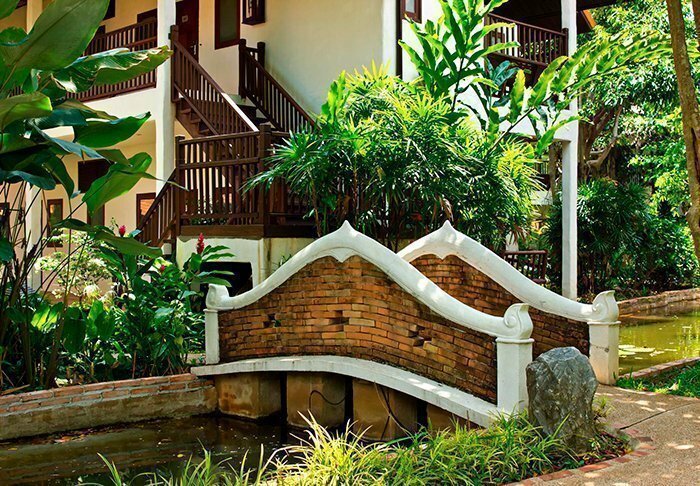 The hotel has three restaurants and two bars, and Khao Lak’s delightful selection of restaurants is just a short walk away. 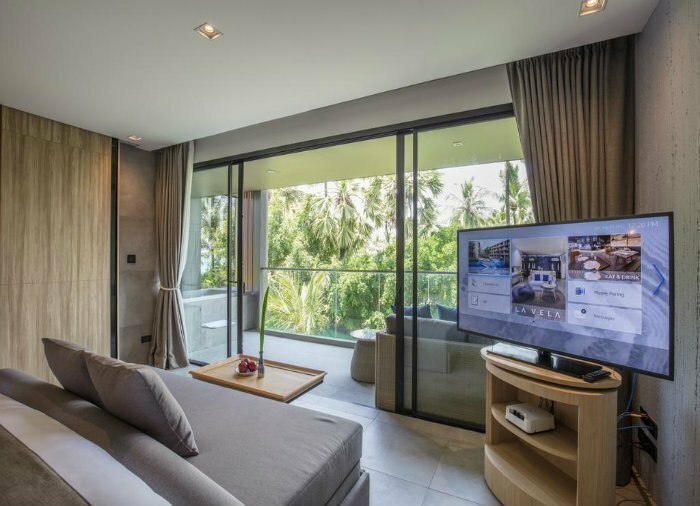 The rooms are spacious and well-equipped, and all of them feature their own balcony or terrace, so the parents can sit outside and enjoy a glass of wine in the evening after putting the kids to bed. All rooms feature free Wi-Fi, TV, minibars, air conditioning, and hair dryers. 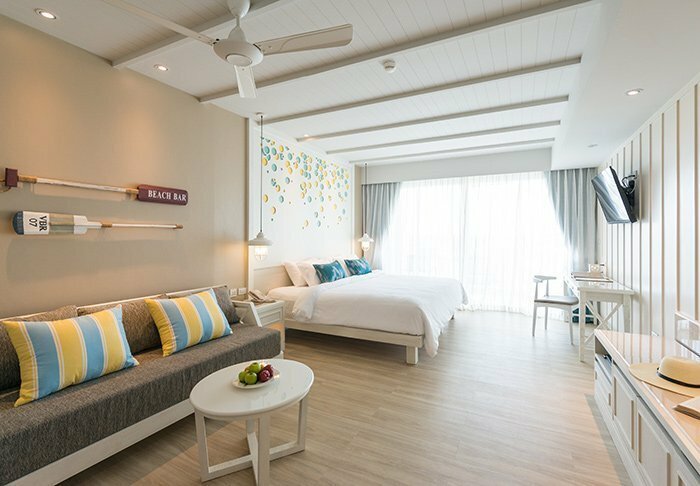 La Vela is a fabulous, modern and stylish hotel that opened in May 2017. 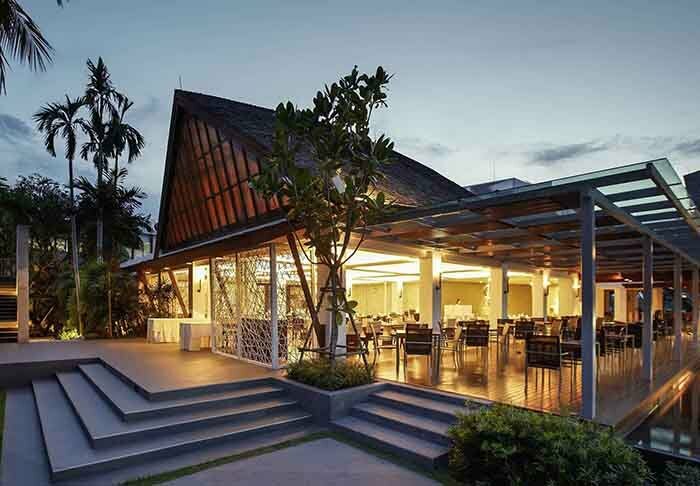 It is inspired by the tropical nature, the glistening sea and the rich cultural heritage of the old Takola harbour. 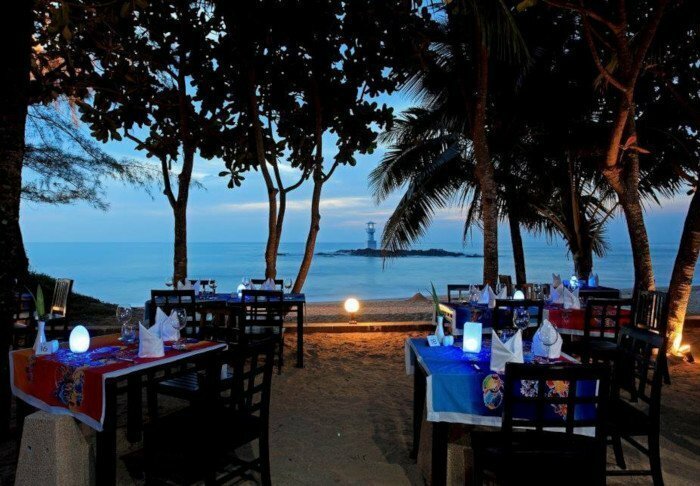 It is located right by the lovely sandy Bang Niang beach, one of the most pristine beaches in Khao Lak. 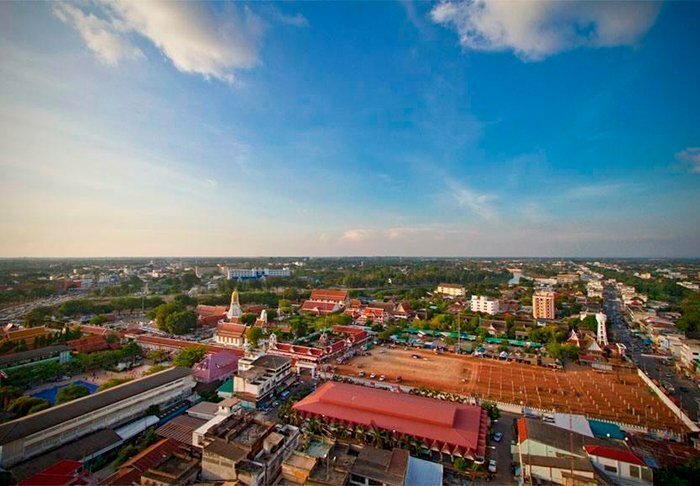 Behind the hotel is the main street, Phet Kasem, where you will find markets, restaurants and shops. 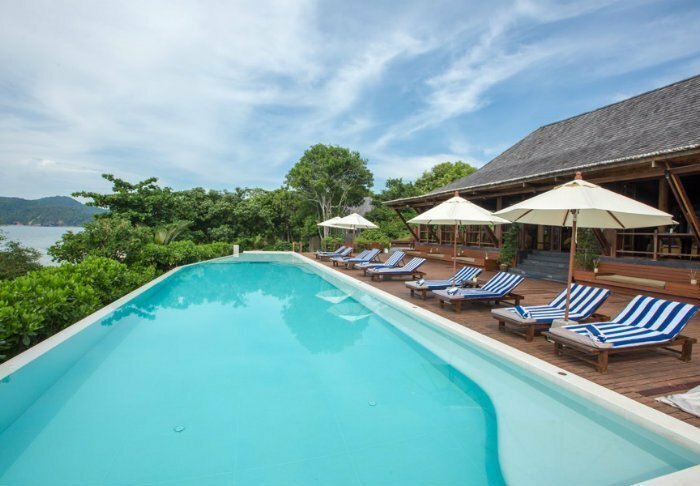 La Vela has 181 spacious rooms, tastefully appointed in wonderful earthy colours. 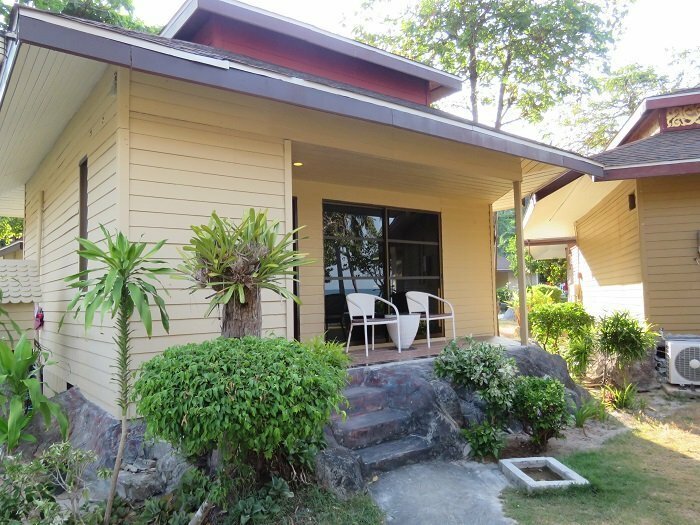 They have everything you need – Wi-Fi, air conditioning, a safe, fridge, TV, telephone, tea and coffee facilities and a nice bathroom with a separate shower and bath, bathrobes, slippers and a hair dryer. From the lovely balcony, you can relax and enjoy the surroundings. 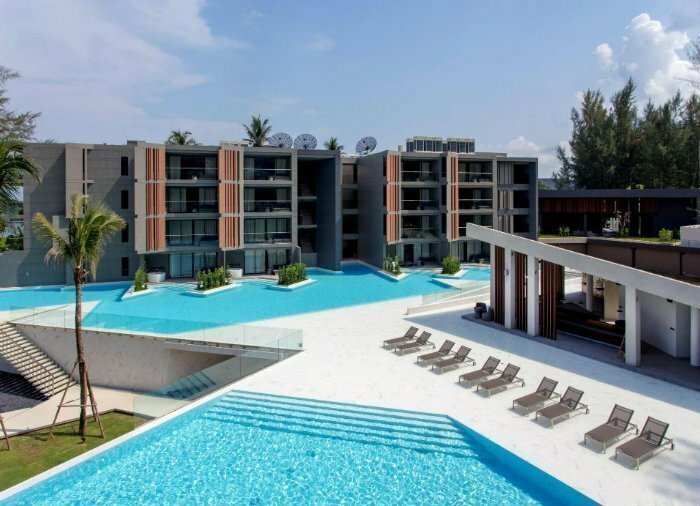 The hotel’s facilities include a spa area, three swimming pools with sun loungers and parasols as well as a gym for those who want to stay in shape. 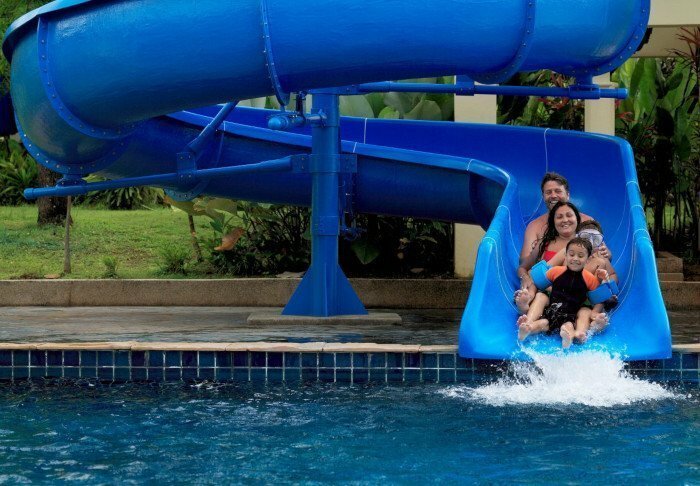 If you are travelling with children, there is a children’s club and a separate children’s pool with a waterslide. The hotel also has a café, a bar and two restaurants. A lovely breakfast buffet awaits you at Spices Restaurant, and at Kokulo Beach Club, delicious dishes are served for both lunch and dinner. You can also enjoy a sunset drink here while the sun goes down over the horizon. 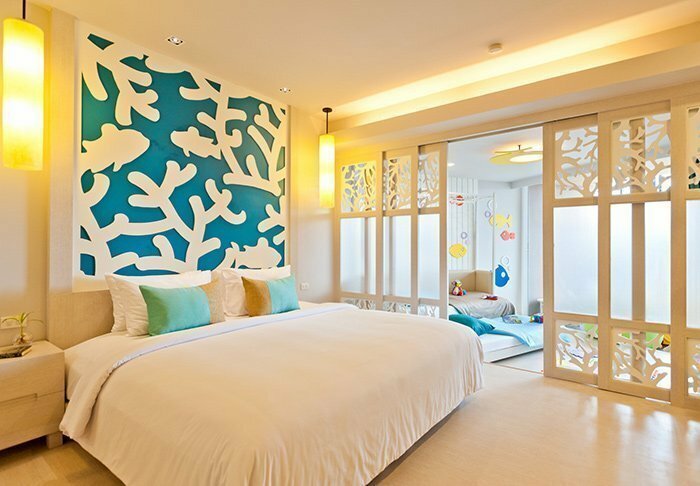 The Sands is the perfect hotel for families with children, located right by Nang Thong’s golden sandy beach. 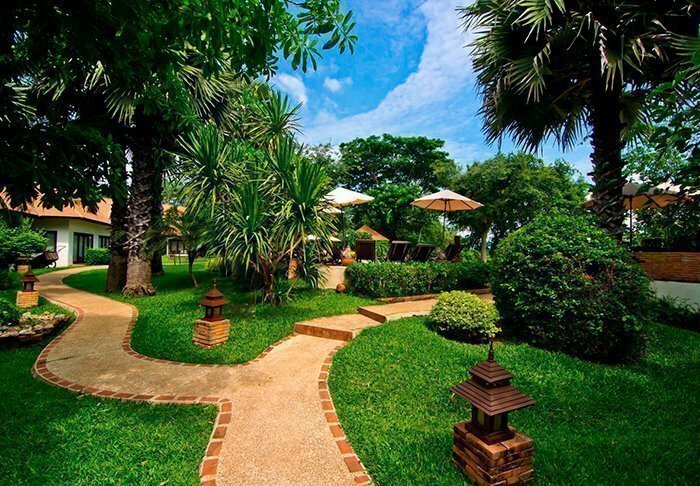 Behind the hotel is the main street, Phet Kasem, where you will find shops and restaurants. 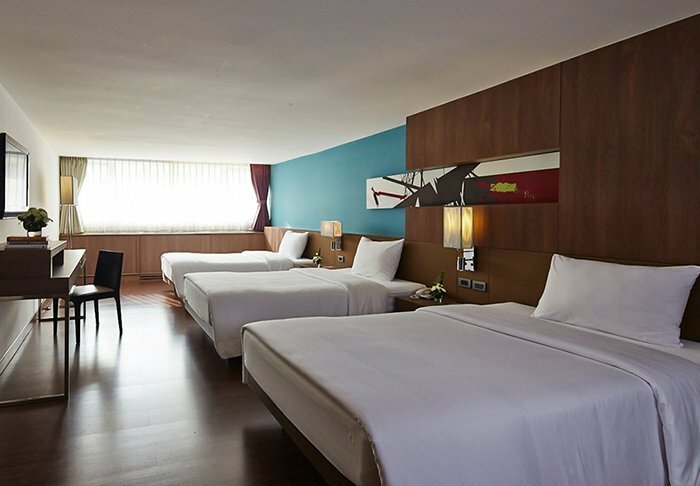 The hotel is divided into three sections and offers a total of 316 lovely, modern and spacious rooms. They are equipped with everything you need – air conditioning, Wi-Fi, fridge, safe, tea and coffee making facilities, TV, telephone, DVD player and a fabulous bathroom with both a shower and a bathtub as well as a hair dryer, bathrobes and slippers. On the balcony, there is a table and a sofa where you can sit and relax or perhaps play a game of cards. 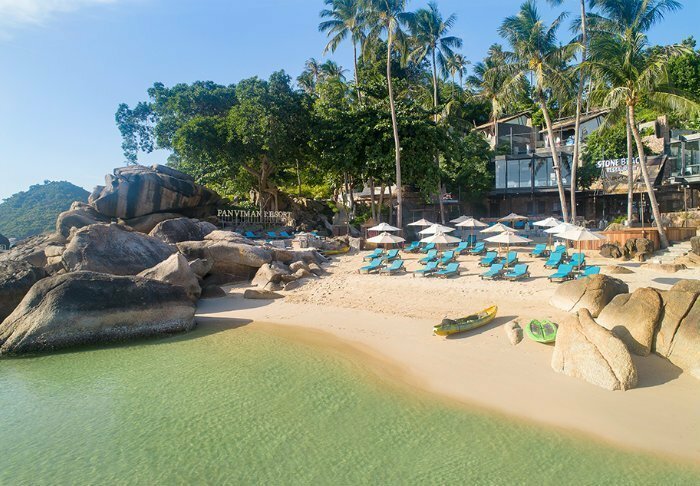 The Sands has a 200-metre-long private beach, which invites you to swim in the turquoise sea, play at the water’s edge and walk in the soft sand. If you’re more of a pool type of person, the hotel has no fewer than nine of them. 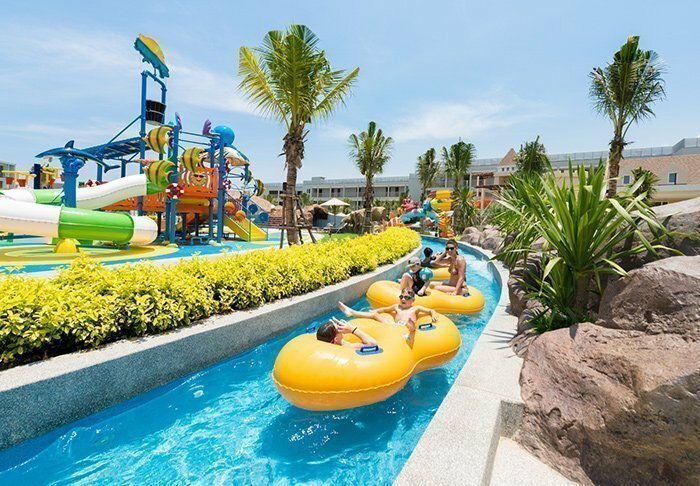 One of the nine swimming pools is a huge, child-friendly water park offering the coolest of activities. 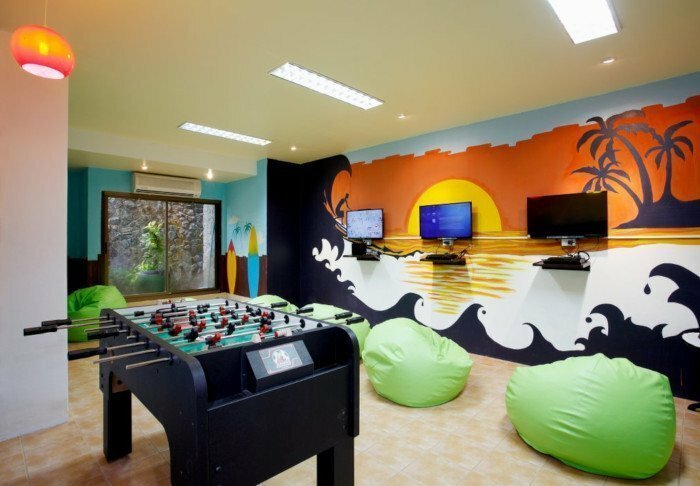 What’s more, the hotel also has a children’s club with a playground, trampolines, ball pit, superhero, princess and reading corner. 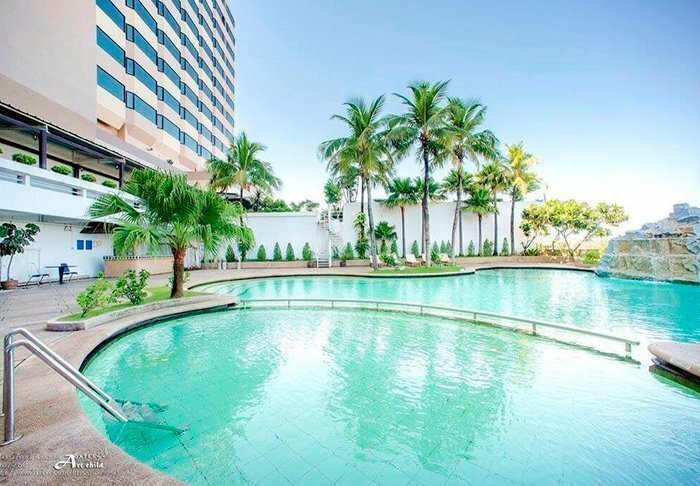 There is also ample opportunity to stay in shape here as the hotel has everything from a gym to tennis courts, and you also have the opportunity to do Thai boxing, water aerobics and yoga. 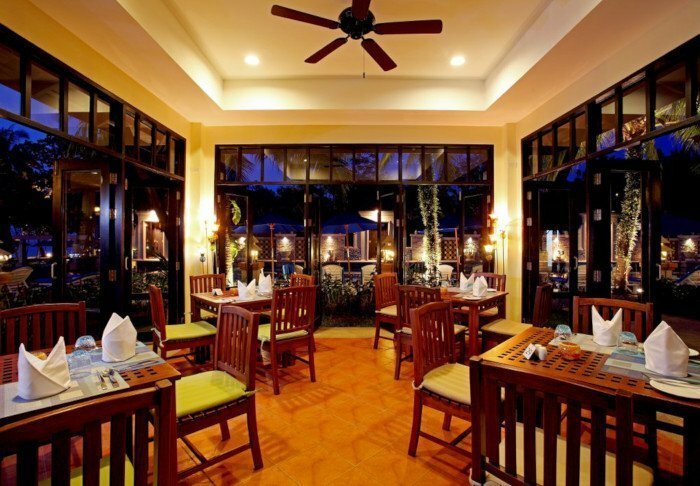 The hotel has several bars and restaurants serving delicious Thai and Western dishes as well as seafood. 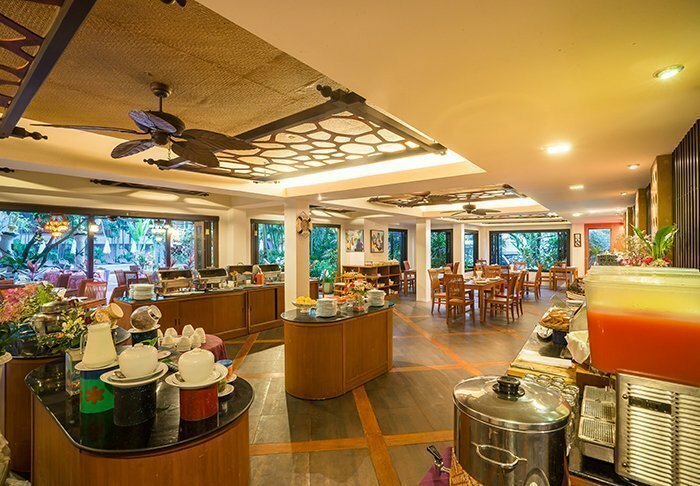 If you fancy learning how to cook the delicious Thai dishes, the hotel has its own cookery school. 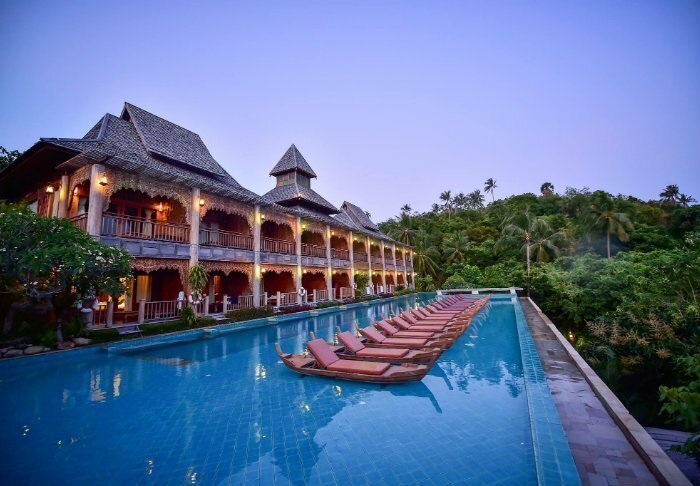 Fantasy Resort & Spa is located right on the alabaster beach of the Andaman Sea, where you can lounge about in the sun, or under a swaying coconut palm tree. When it gets too hot, you can take a dip in the clear, lukewarm water, or explore life beneath the water’s surface. 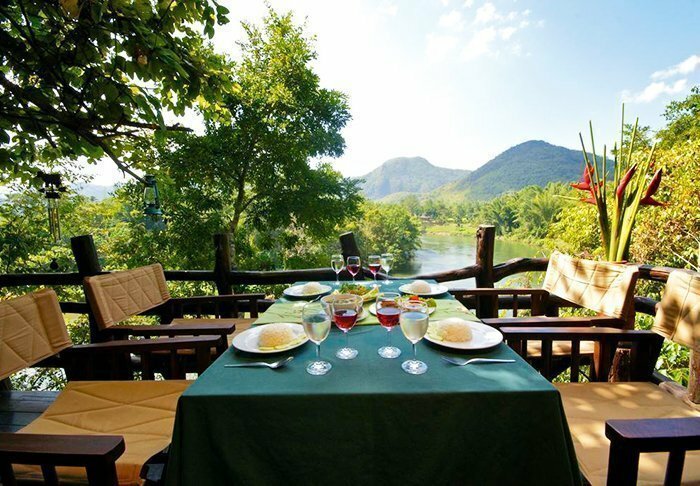 The resort is built up against the green-clad mountains, which help create a perfect background. 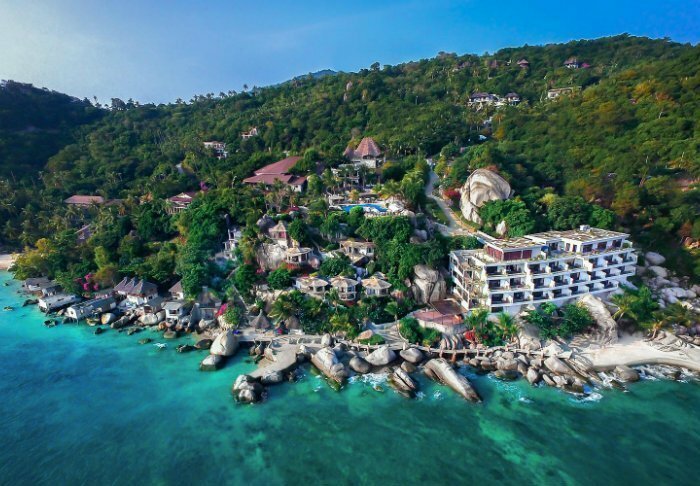 Fantasy Resort & Spa has a total of 85 rooms, all of which are surrounded by tropical gardens with a partial view of the steep cliffs out in the turquoise sea. 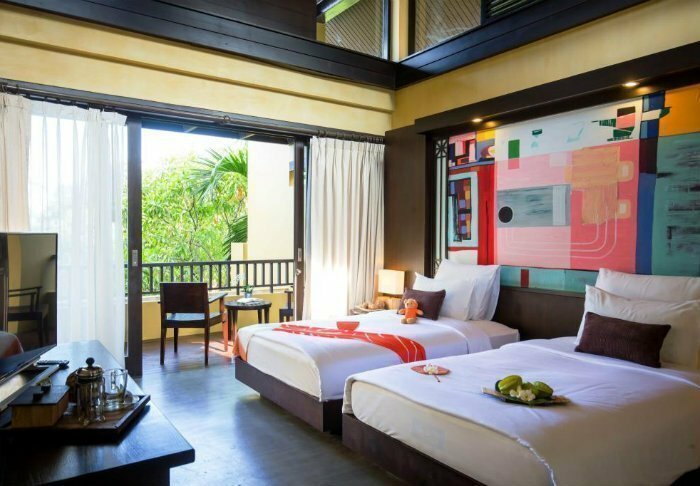 The deluxe rooms are spacious and feature a private balcony, where you can sit and take in a book or just enjoy the surroundings. 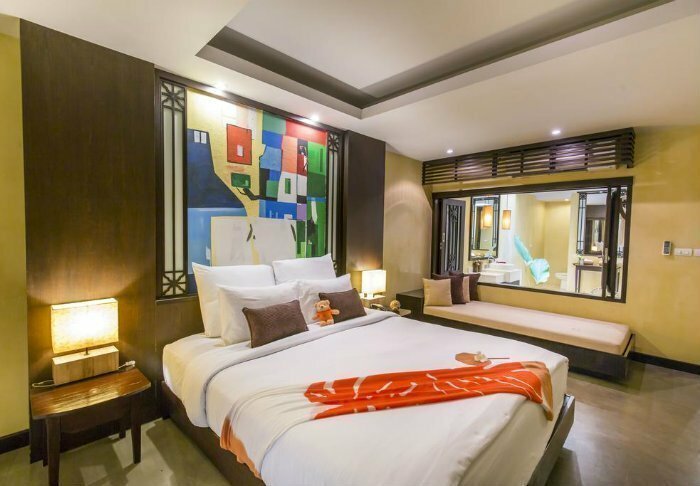 All rooms are equipped with Wi-Fi, air conditioning, TV and a minibar. 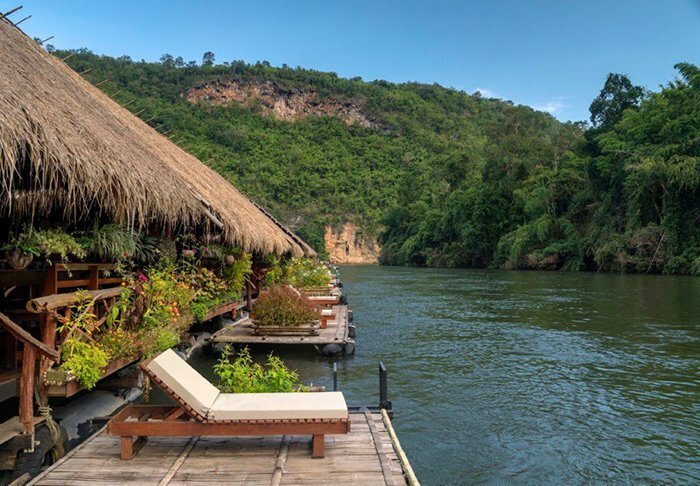 To make your stay complete, the resort naturally also has an elevated pool with deck chairs and a pool bar, as well as a bar and restaurant where you can sit and enjoy the delicious Western and Thai dishes under the open skies. 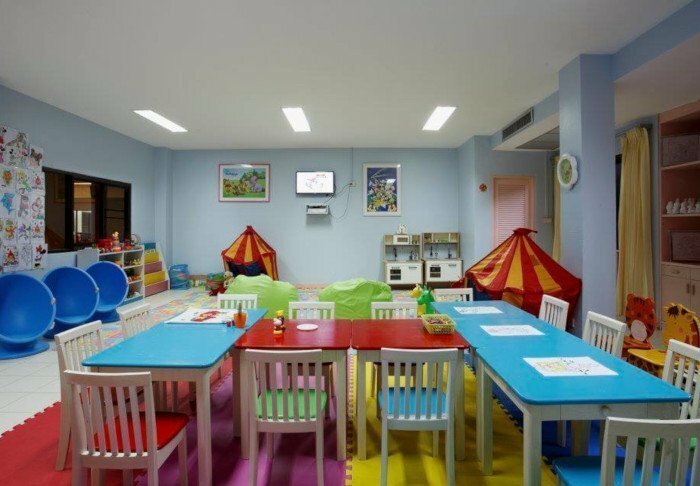 Additional facilities include a spa area, a mini-market and a small play space for your children. 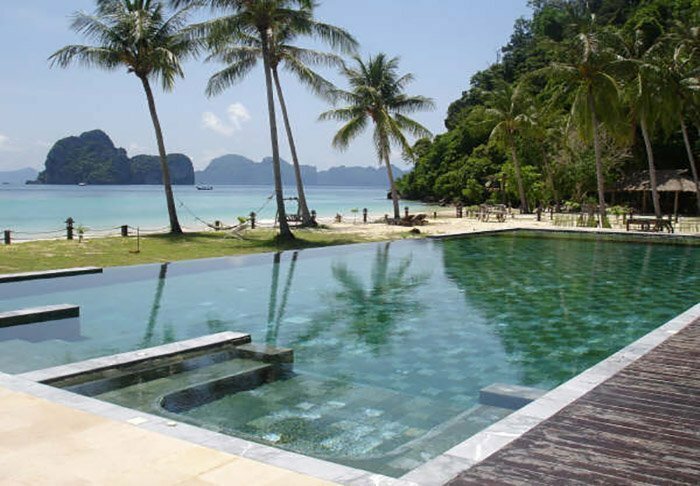 Koh Ngai Cliff Beach Resort is built on the cliffs with a spectacular view of the ocean. When you’re lying by the elevated pool, it takes quite some willpower to step back from this indescribable view. The resort has 36 bright and spacious rooms with balconies, where you can relax at the view of the lush surroundings and the chirping birds. 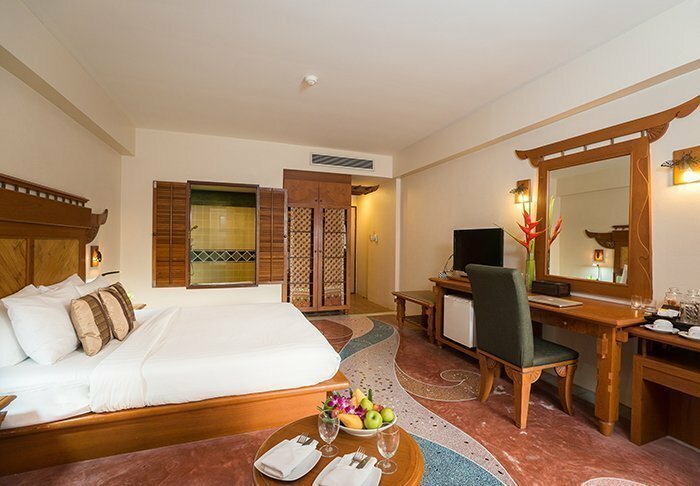 All rooms are equipped with Wi-Fi, air conditioning, TV, minibar and free mineral water. 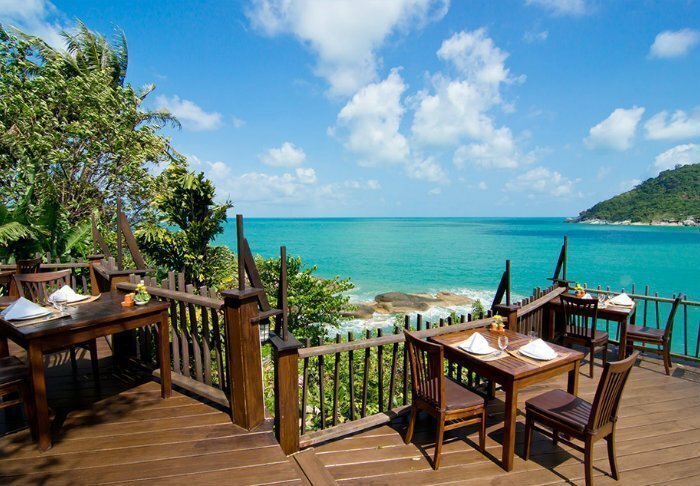 In the restaurant, you can enjoy delicious buffet dishes with a view of the Andaman Sea. Down from the hotel you can find the island’s best snorkelling opportunities. Unfortunately, there’s not much of a beach here, but it’s not much further away than a few metres to the right. 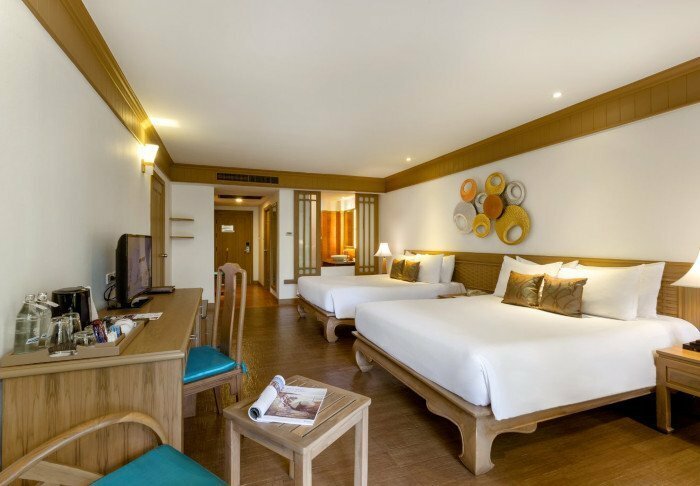 You can also choose to head down to the sister hotel, Fantasy Resort & Spa, to use their facilities. 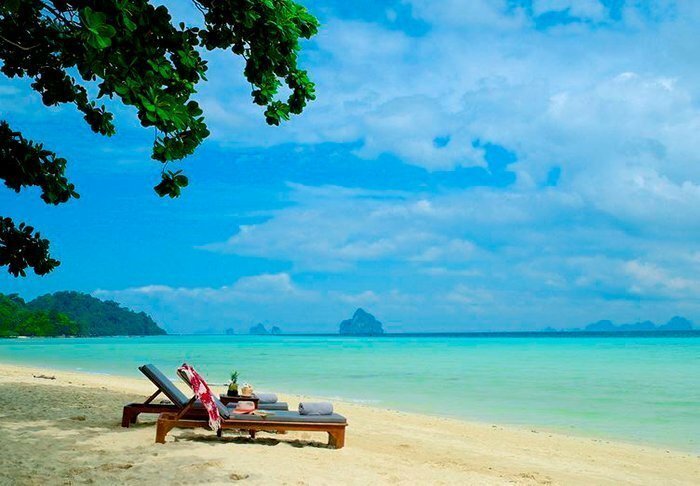 Thanya Resort is located right on the tranquil white sandy beach in Koh Ngai with its incredibly idyllic turquoise water. 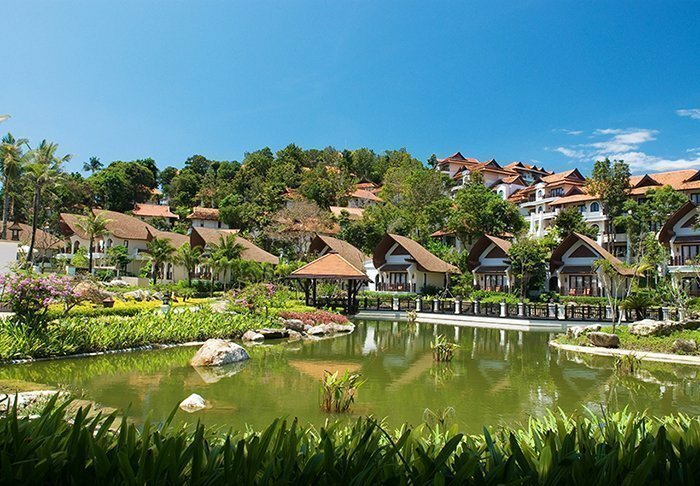 The tropical gardens and the wooded mountain, which provide the setting for the resort, help make for a relaxing atmosphere. 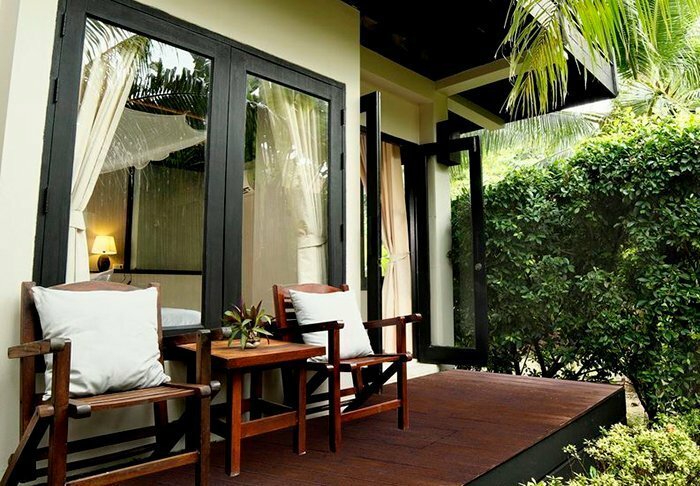 The resort’s bungalows all have their own balcony on which you can enjoy the lush nature or relax with a good book. 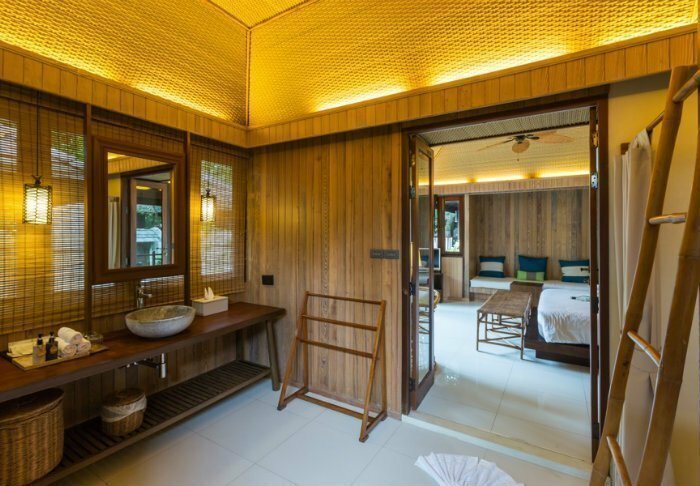 The bungalows are decorated in authentic Thai style and all have air conditioning, a minibar and a free daily bottle of mineral water, as well as a hair dryer and toiletries. A mosquito net is also available. 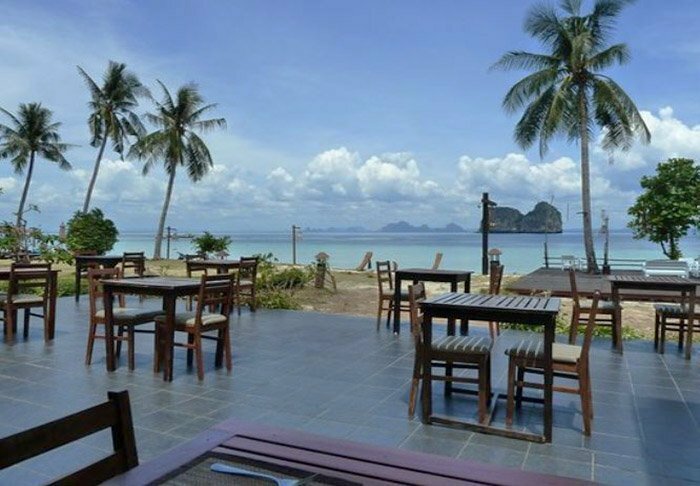 In the restaurant, you can choose from a large selection of Thai and international dishes while admiring the view of the Andaman Sea. You can also enjoy a refreshing drink at the resort’s bar while the stars twinkle overhead. There is free Wi-Fi in the communal areas. 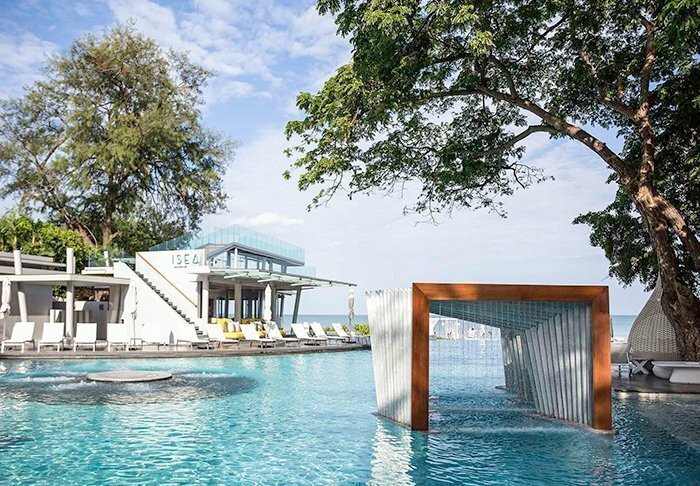 When the sun’s rays get too hot, you can cool off in the elevated pool and look out over the turquoise sea, or lie in the shade of a parasol in one of the sun loungers on the white beach. 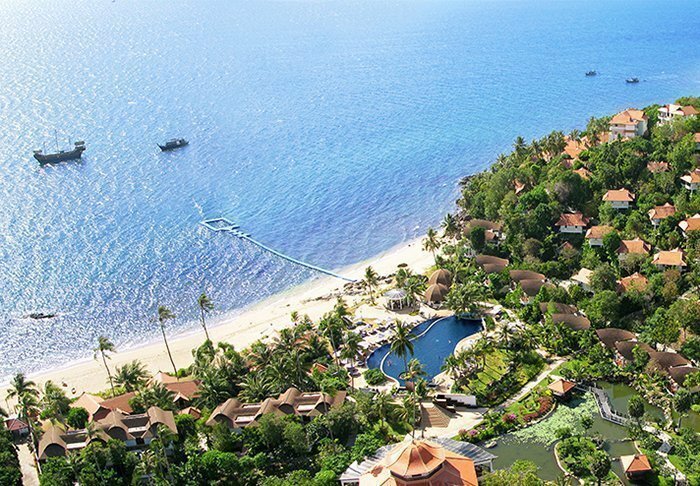 You also have the option of snorkelling, diving trips or boat trips to the nearby islands. And why not treat yourself to a traditional Thai massage? 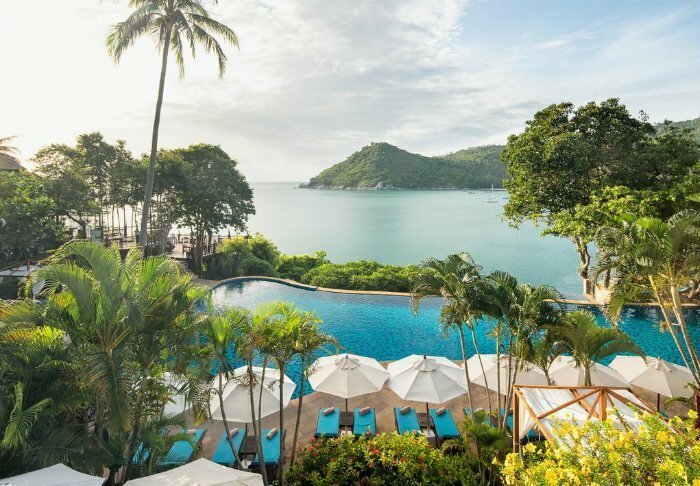 The Sevenseas Resort is located on the untouched, lush island of Koh Kradan right down by the long sandy beach, and boasts a view of the iconic steep cliffs that stand vertically out of the crystal-clear water. We guarantee that you will completely unwind here, because this is where calm and a relaxing mood can be found. 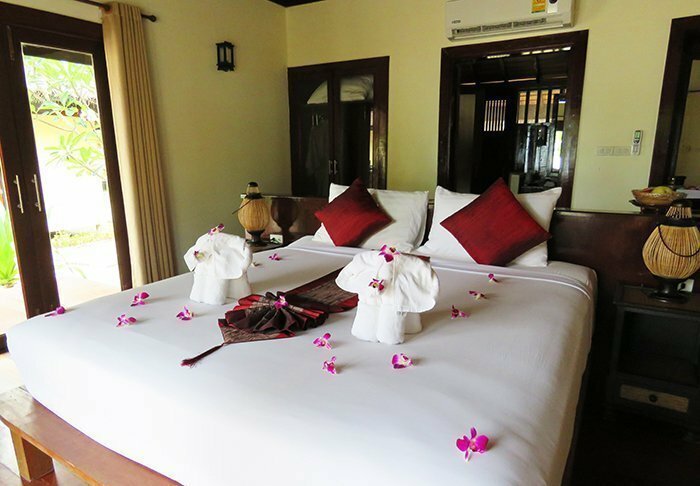 The resort has 39 rooms with modern and comfortable interiors. 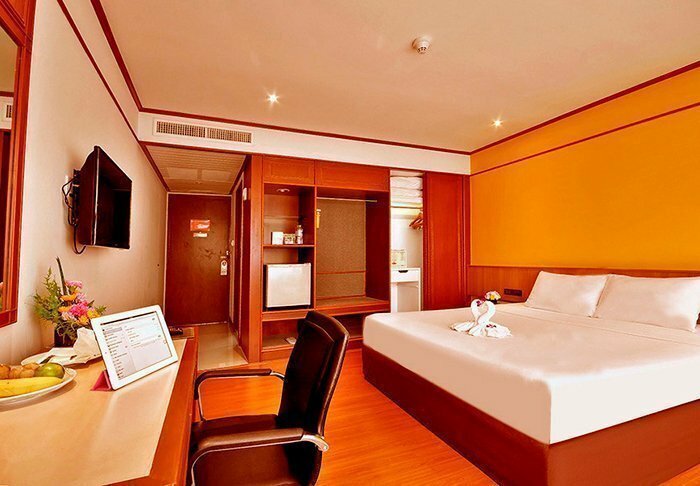 The deluxe rooms are 44 km2, and are equipped with air conditioning, TV, safe and a minibar. 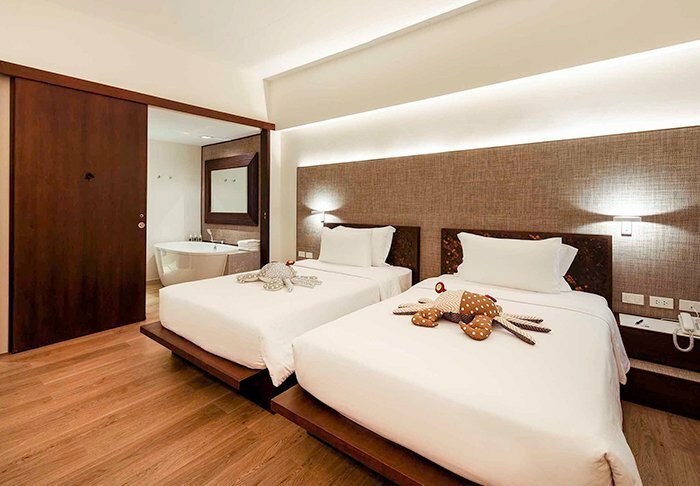 The rooms also feature exterior bathrooms with complimentary toiletries, and a small balcony with chairs. 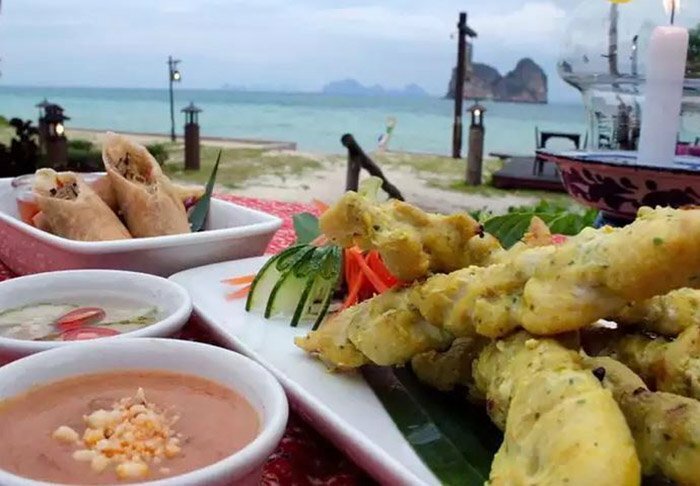 There is free Wi-Fi in the reception and in the restaurant, which serves Thai and Western dishes under dimmed lighting under the open sky. 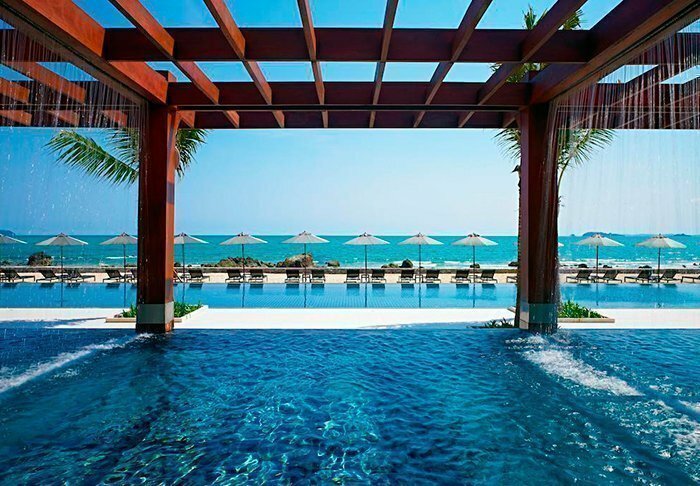 Next to the restaurant are the pool and the bar, where you can enjoy a refreshing evening cocktail. You also have the opportunity to try diving, or you can rent some snorkelling gear. You can go snorkelling right from the beach out to the reef, where you can see a lot of colourful and curious fish, who also don’t mind swimming all the way to the beach. 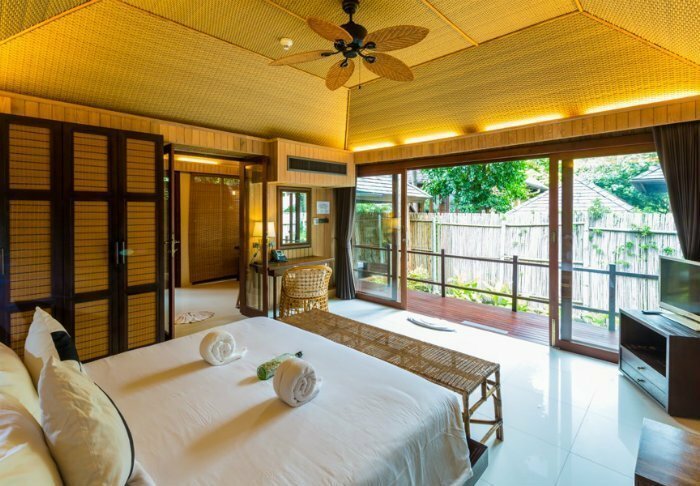 As a finishing touch, the resort offers three exterior massage rooms, where you can enjoy both Thai and classic massage. 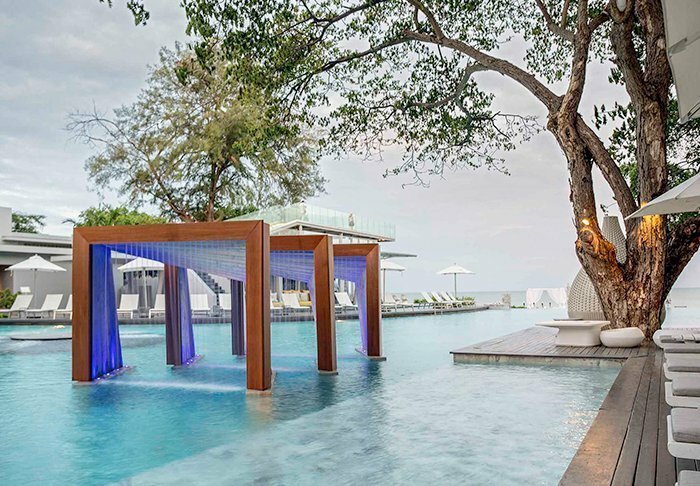 The lovely 5-star Rawi Warin Resort and Spa is located directly on the beach at Koh Lanta Yai, about 2 hours away from the airport in Krabi. 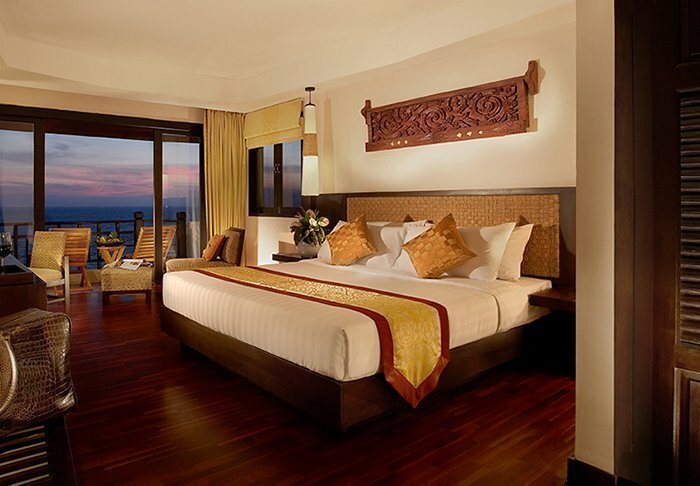 The resort is built from the beach and goes a short way up a slope, so many of the rooms have an ocean view. 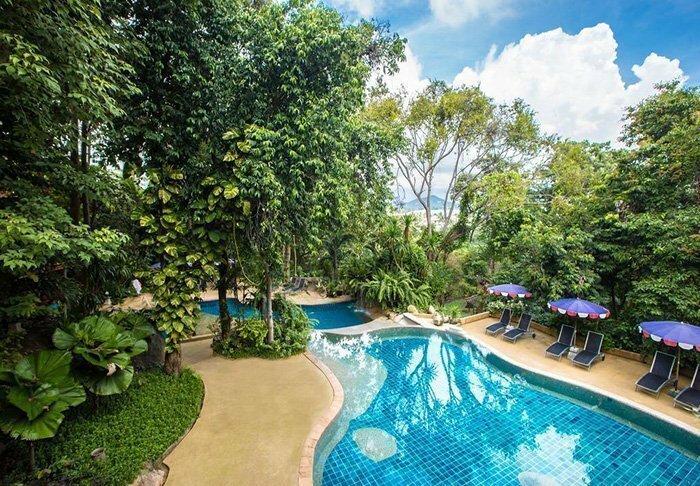 The resort is located in a tropical garden and has 4 large outdoor swimming pools, including an infinity pool close to the beach. Here you can find a fitness centre, tennis courts, a library, recreational facilities and no less than 6 restaurants and cafés. Warin Spa offers both massages and beauty treatments (paid separately), and can put together complete spa packages. Finally, there are, of course, a series of water sports facilities, some which are paid separately. 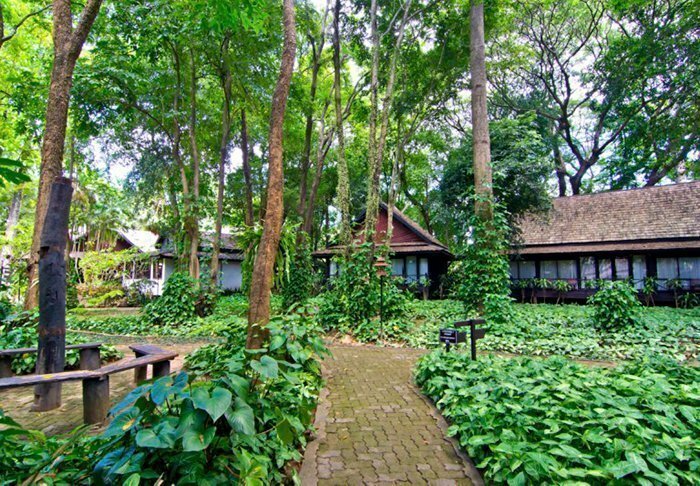 The hotel has 185 rooms in bungalow buildings or villas. 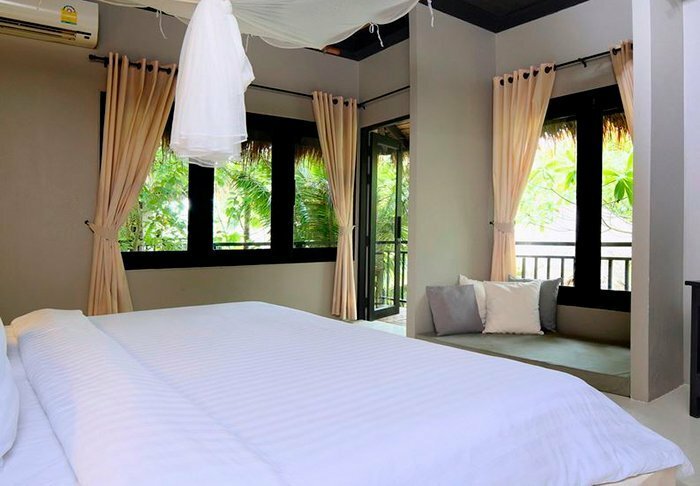 The rooms have a luxury interior as well as a balcony or terrace, Wi-Fi, bathroom, hair dryer, air conditioning, cable TV, safe, telephone, refrigerator, minibar, and tea and coffee facilities. 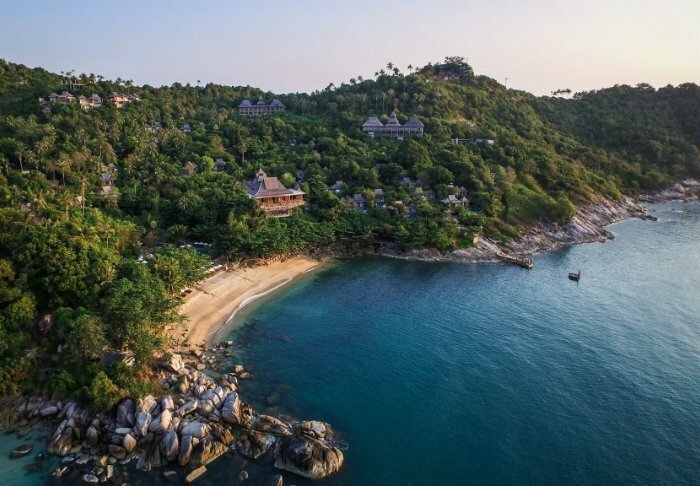 The Treasure is situated on the small, untouched and private island of Koh Madsum. It is the only hotel on the island, where there are no roads, no cars and no busy tourist centres. Instead, there is wonderful natural beauty and tranquillity. 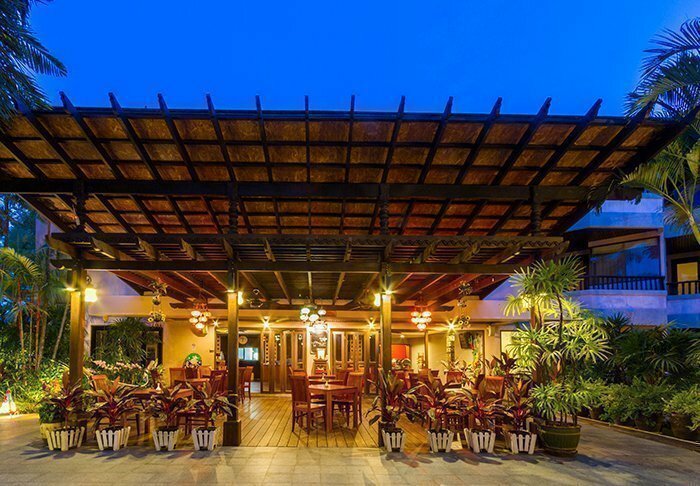 The hotel is designed in harmony with the surroundings and built using natural materials. 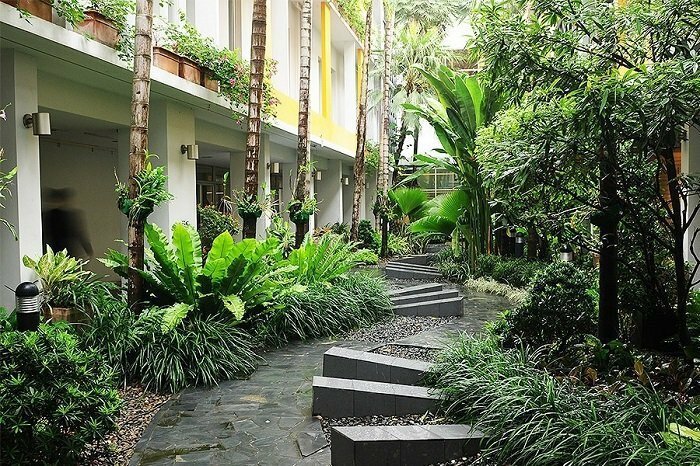 It consists of 37 lovely rooms and has a bathroom with indoor and outdoor shower and a nice terrace where you can immerse yourself in a good book and just enjoy the silence. The rooms all have Wi-Fi, ceiling fans, air conditioning, mini bar, coffee and tea making facilities, TV, telephone, safe and hair dryer. 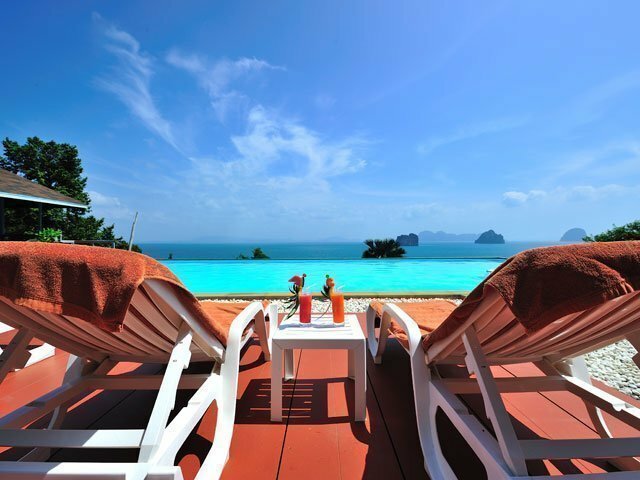 On one side of the island you can laze on a sun lounger at the water’s edge and look out over the azure sea to Koh Taen, the neighbouring island. On the other, you can go snorkelling among the colourful tropical fish. 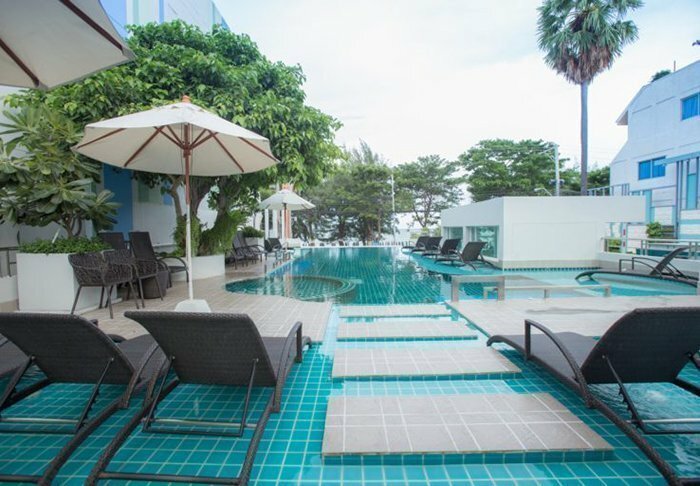 The hotel also has two swimming pools, one of which is in an elevated position overlooking the sea, where you can enjoy drinks and snacks. 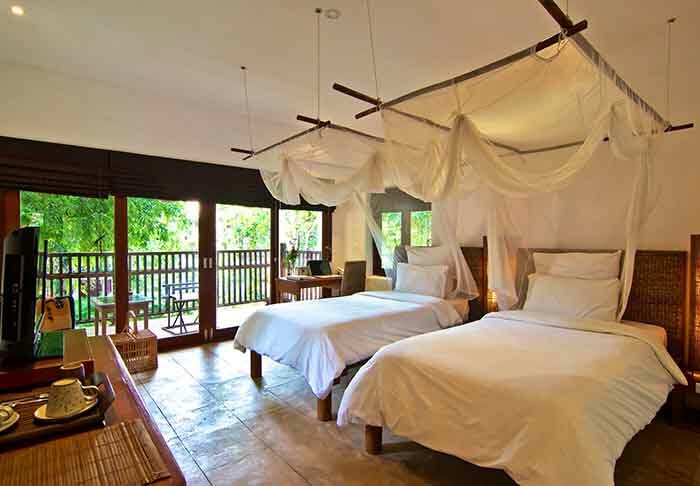 The other is located near the “tented villas” room category. Additional amenities include a day spa and kayak rental. 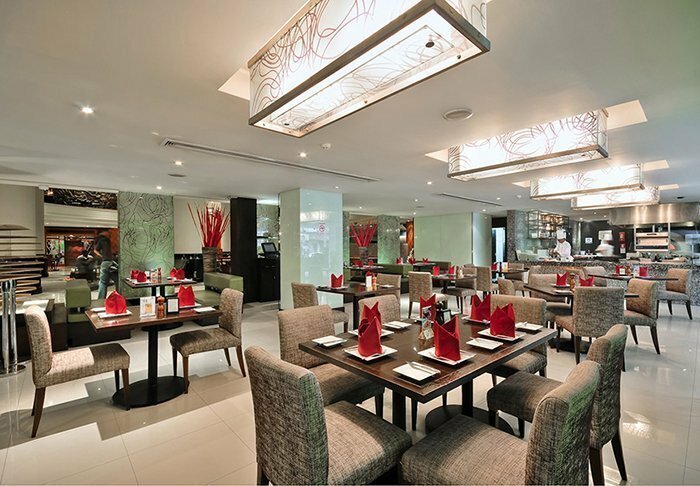 When hunger strikes, you can enjoy delicious Thai and international dishes in the hotel’s restaurant. 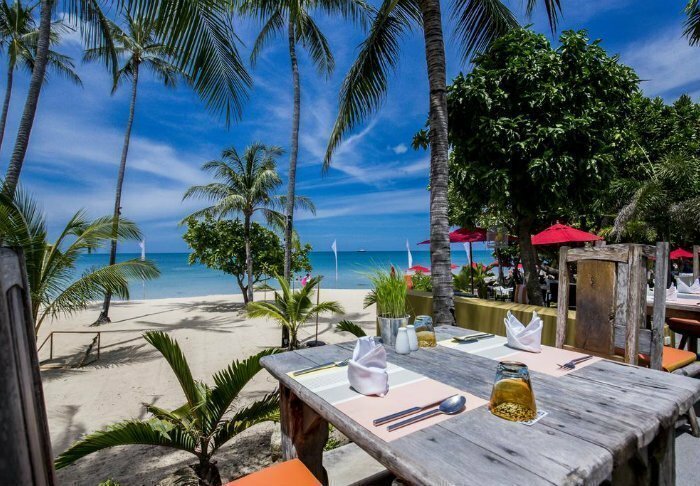 On the northern tip of the island, you will find another restaurant, and this is owned by people from Koh Samui who take the boat back and forth between the islands every morning and every evening. 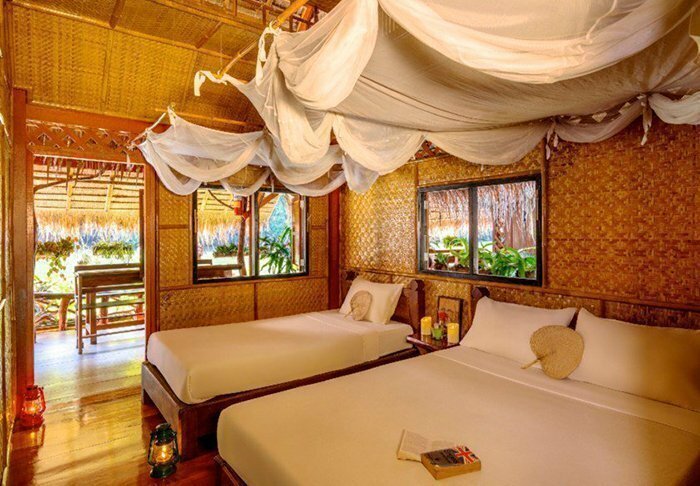 This means that the only people staying overnight on Koh Madsum are the hotel’s guests. 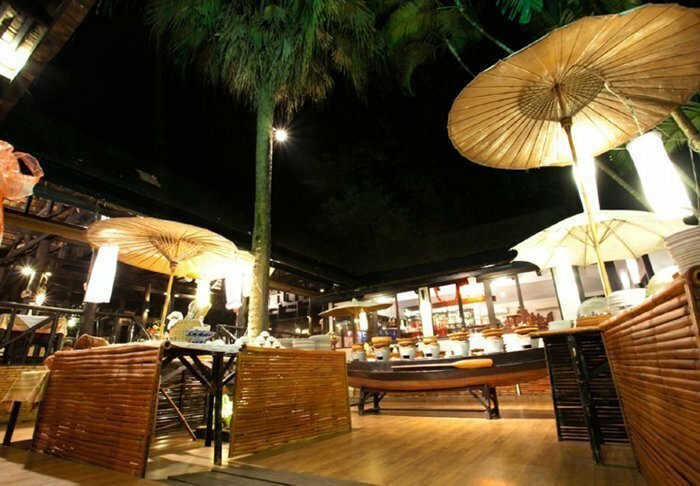 In the evening, you can enjoy the island atmosphere and grab a drink from the hotel’s bar. Sivalai Beach Resort has direct access to the Hao-Laen beach. The best part of the resort is that you can use the beautiful beaches on both sides. Here you can laze about in the sun and bathe in the turquoise water, or lie back in a hammock, listening to the chirping birds and crashing waves. 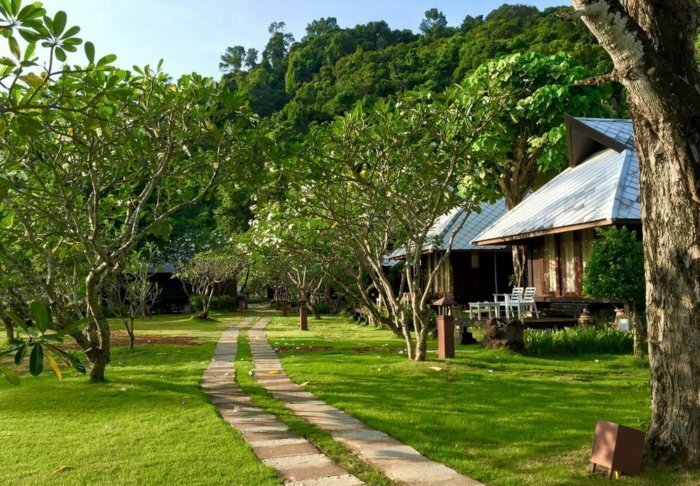 The resort consists of 48 independent wooden cottages in lush, tropical gardens. 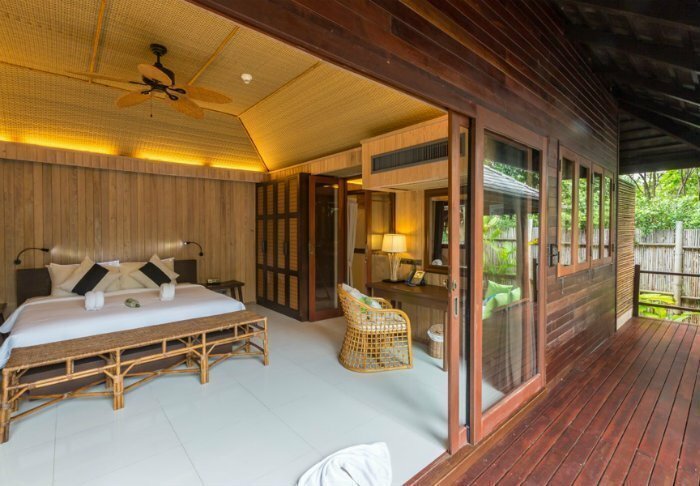 From the standard villas, you can enjoy a partial view of the sea from your private terrace, which is furnished with deck chairs and a small table. Cottage facilities include air conditioning, minibar, TV, coffee and tea, free mineral water and a fruit basket, as well as bath robes and toiletries. 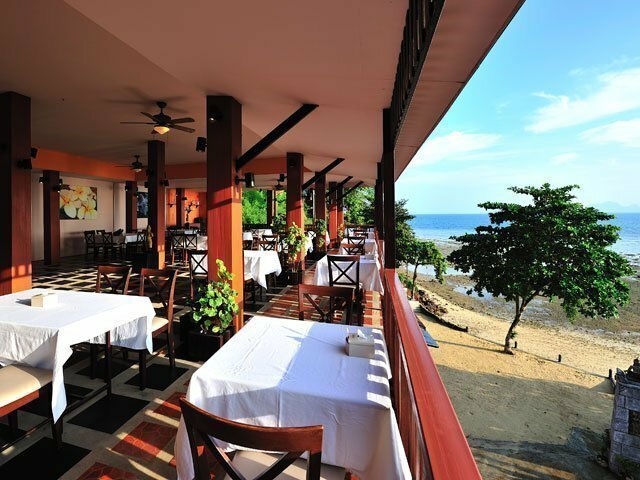 There is free Wi-Fi access at the reception and the restaurant, which also serves Thai and Western dishes including fish and shellfish. After a lovely day in the baking sun, you can book time in the spa area for a massage or a facial treatment – it’ll take you to the seventh heaven! 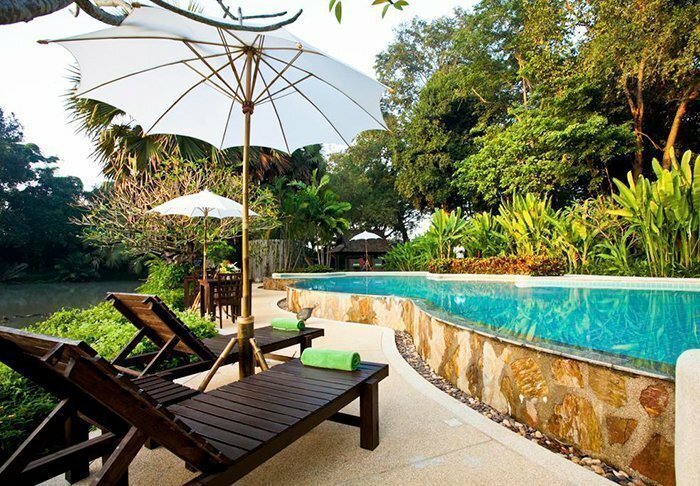 The resort also has a swimming pool, and you have the option of renting bicycles or kayaks. The reception will also help you arrange excursions. 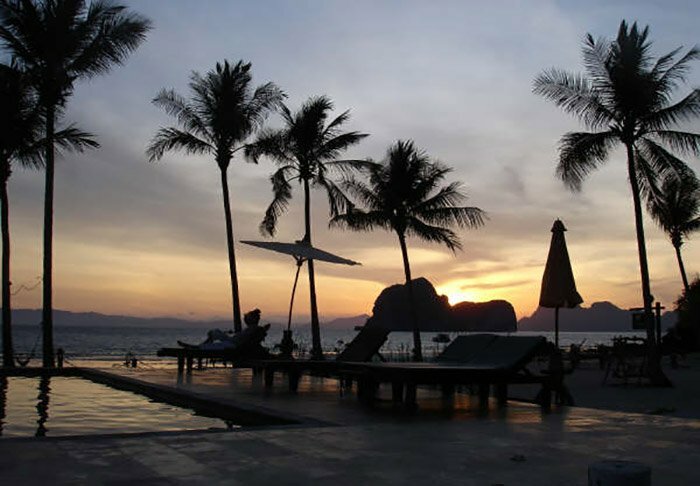 In the evening, you can take a trip along the beach as the sun dips behind the mountains and you watch the gorgeous sunset. You can also walk or cycle down to the nearby village, where you can find restaurants, shopping opportunities and small souvenir shops. 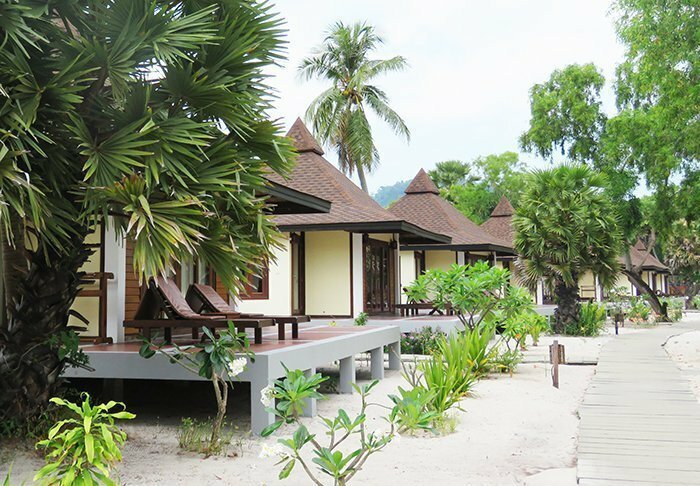 Panviman Resort Koh Phangan is a hidden gem in a quiet area by the unspoilt beach of Thong Nai Pan on the north-eastern side of the island. 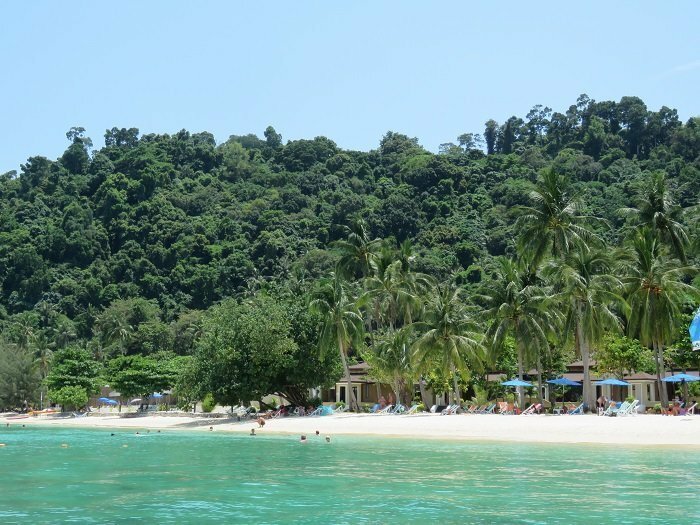 Thong Nai Pan beach is located in a beautiful bay surrounded by cliffs and lush tropical vegetation. The resort enjoys an elevated position on several levels up the green cliffs. A service car is therefore on hand to drive you around the resort. 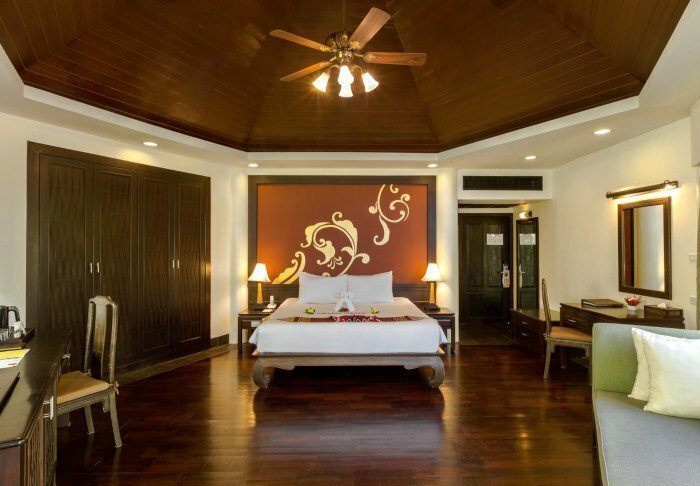 Panviman has a total of 91 beautiful and stylish rooms with dark wood furniture and light walls. The rooms all have Wi-Fi, air conditioning, a minibar, coffee and tea making facilities, TV, telephone, safe and you can also choose your own pillow. And if that wasn’t enough, all rooms also have a smartphone with free data. 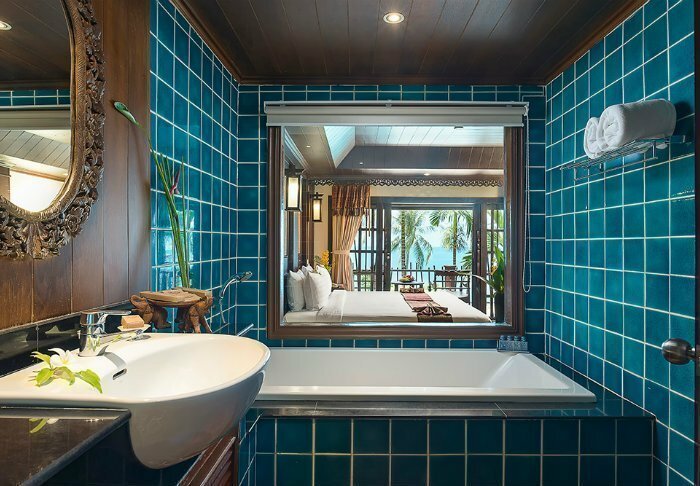 The bathroom has both a shower and a bathtub, as well as a hairdryer, bathrobes, slippers and toiletries. Beach sandals, beach bags and beach towels are also provided. 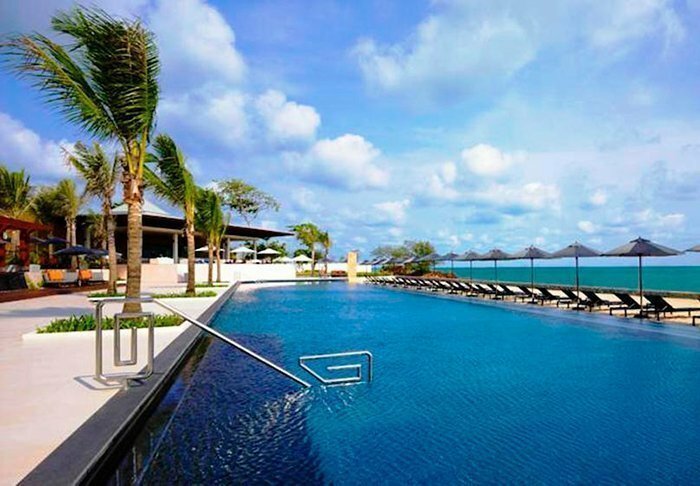 The resort offers peace and relaxation by the pool, which overlooks the bay. There is a pool bar serving light lunches and drinks. There is also a day spa where you can book an appointment for a genuine, relaxing Thai massage. From both the pool and the day spa, you may be lucky enough to witness the most beautiful sunrise. 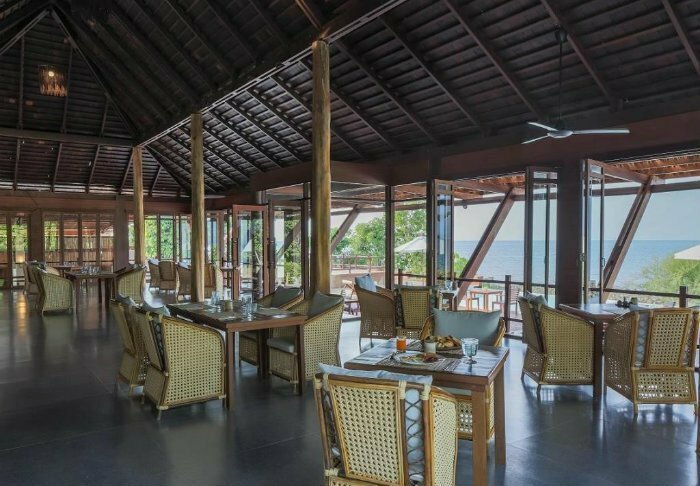 Breakfast is served in the Pan Sea restaurant, which offers magnificent panoramic views of the sea. 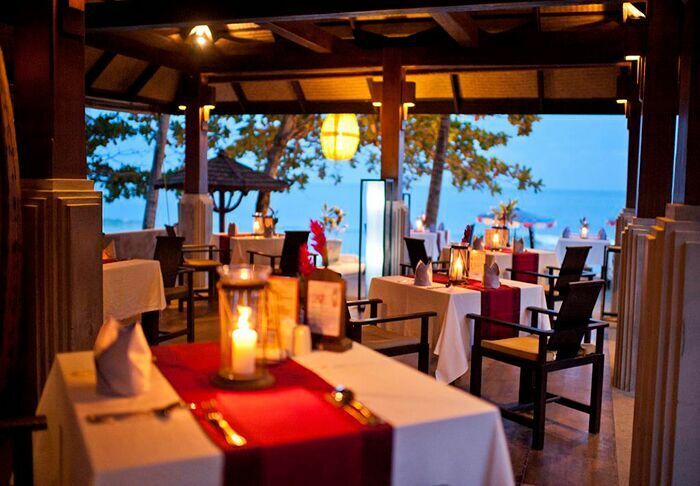 Lunch and dinner are served in the Stone Beach restaurant, located directly on the beach. 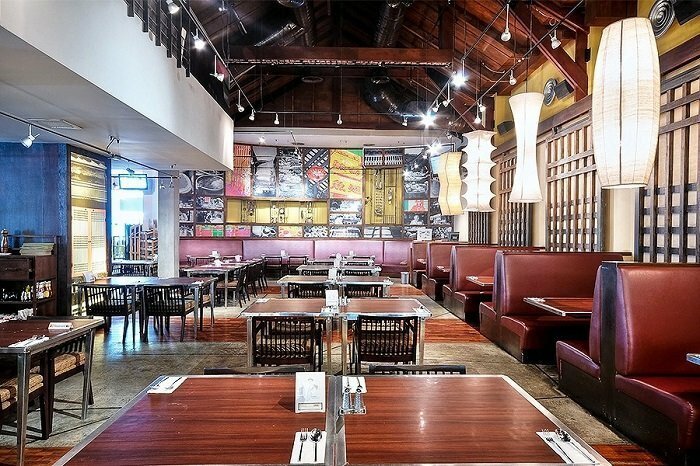 It serves Thai and international dishes as well as barbecue. There is also music and live shows. The resort is happy to help with the booking of excursions. 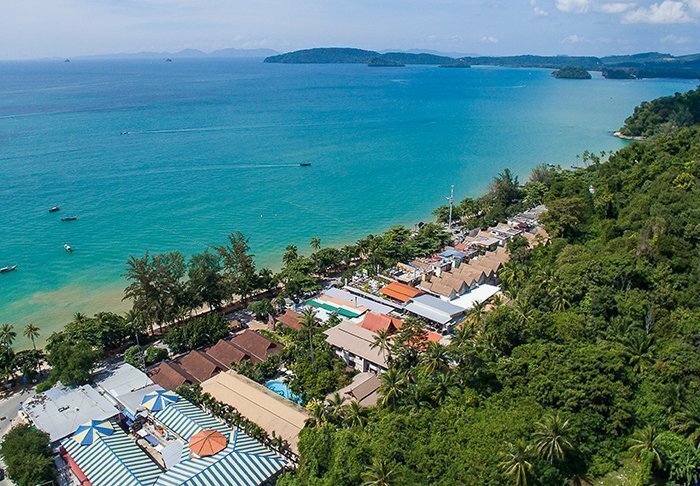 Santhiya Koh Phangan Resort & Spa is located by Thong Nai Pan beach on the north-eastern side of Koh Phangan. 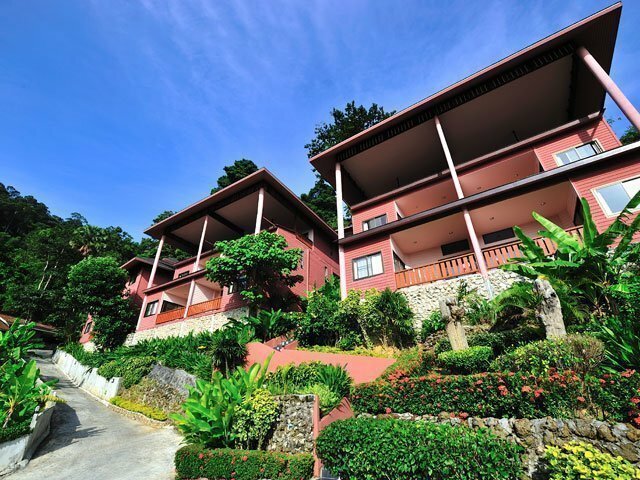 The resort extends over an area of 18 hectares and is set on a beautiful bay with cliffs and lush, tropical vegetation. Built up the green-clad rocks, Santhiya is located on several levels. A service car is therefore on hand to drive you around the resort 24 hours a day. 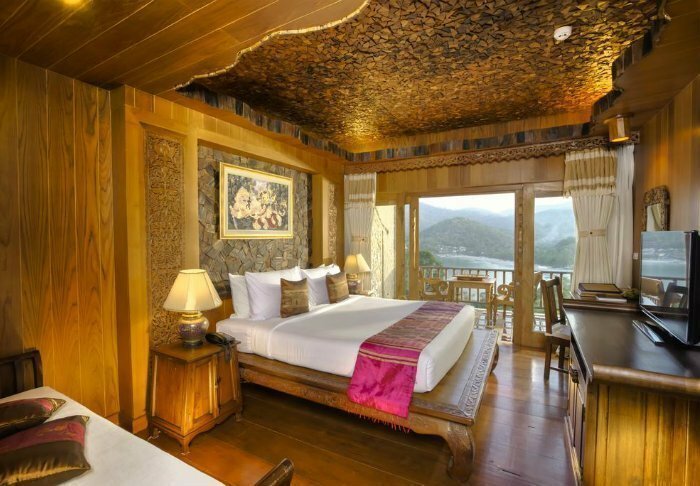 Santhiya is built in traditional style and in the finest teak, which harmonises perfectly with the surrounding nature. All over the resort, you can see the impressive and meticulous details of the many wood carvings. 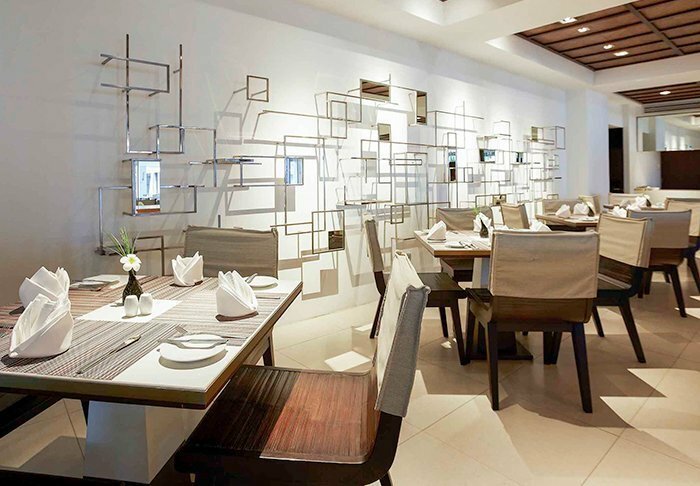 The traditional style carries through to the 99 rooms with teak furniture. To make your stay as comfortable as possible, the room offers Wi-Fi, air conditioning, a minibar, a safe, coffee and tea facilities and four complimentary bottles of water a day. The bathrooms are fitted with a shower and bath tub, and a hair dryer, bathrobes, slippers, and complimentary toiletries are provided. 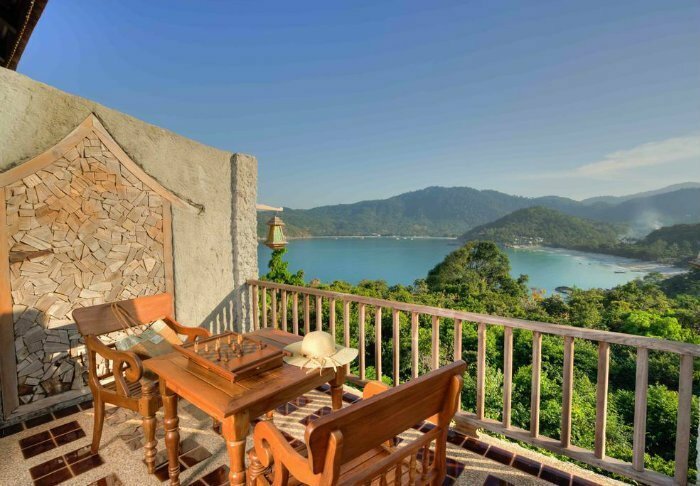 In the morning and evenings, you can relax on your private veranda, the view from which will take your breath away! There are two lovely swimming pools. 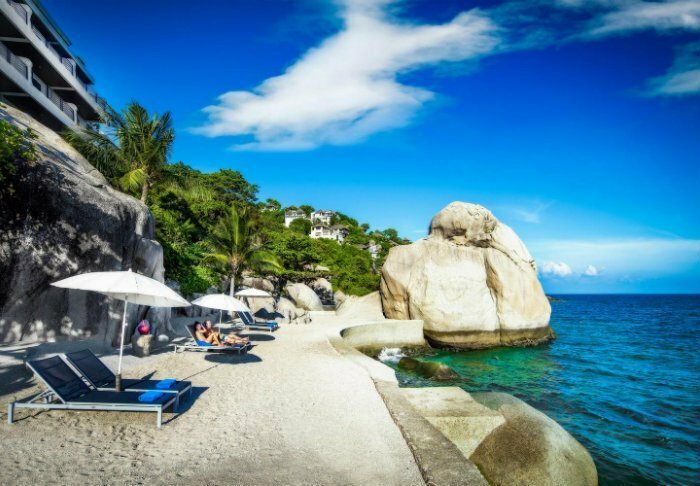 One has access to the beautiful sandy beach, while the other is in an elevated position, affording breathtaking views of the bay, which can be enjoyed from the fun sun loungers shaped like the traditional long-tail boats. 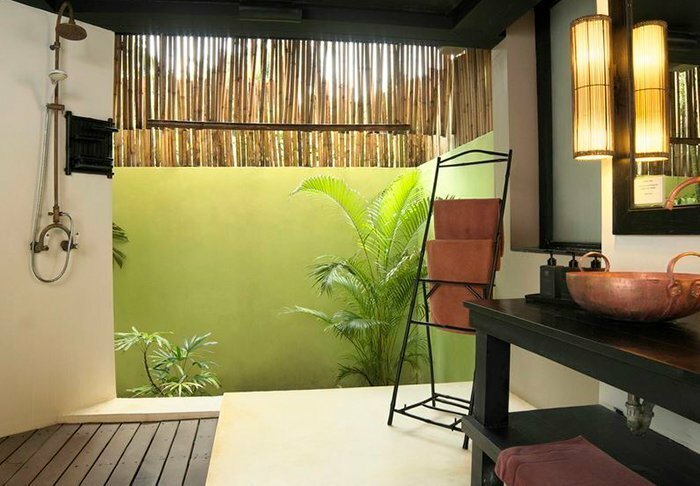 If you enjoy a spot pampering, be sure a visit to Ayuvana Spa, where you can book various luxurious treatments. 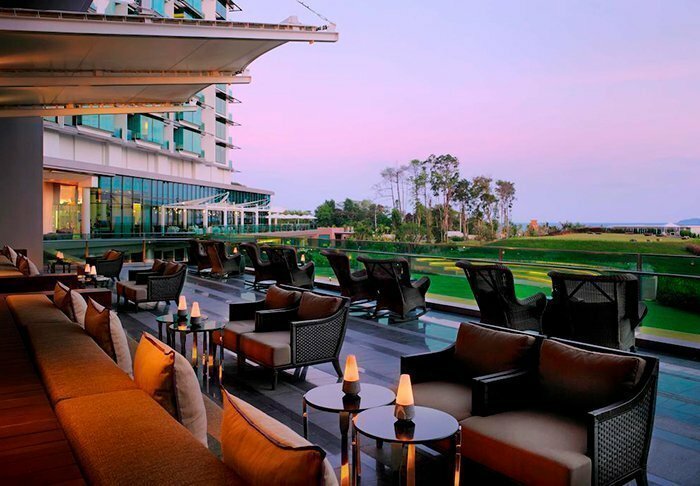 In Chantara restaurant, you can enjoy delicious Thai and international dishes overlooking the sea. 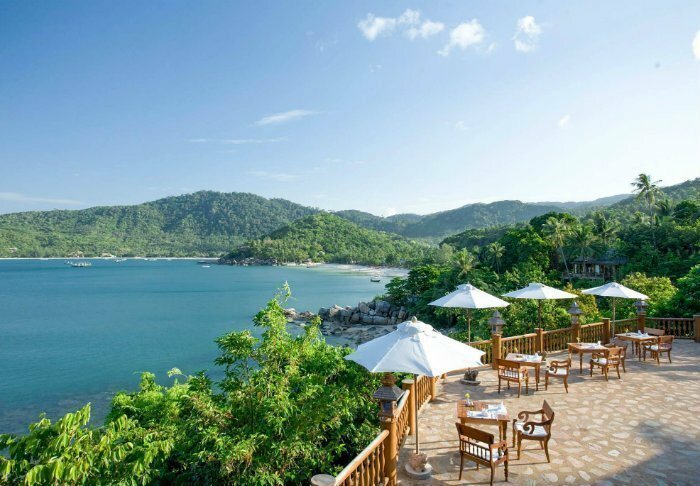 The resort also has a beach bar where delicious cocktails are served to the sound of the waves lapping the shore. 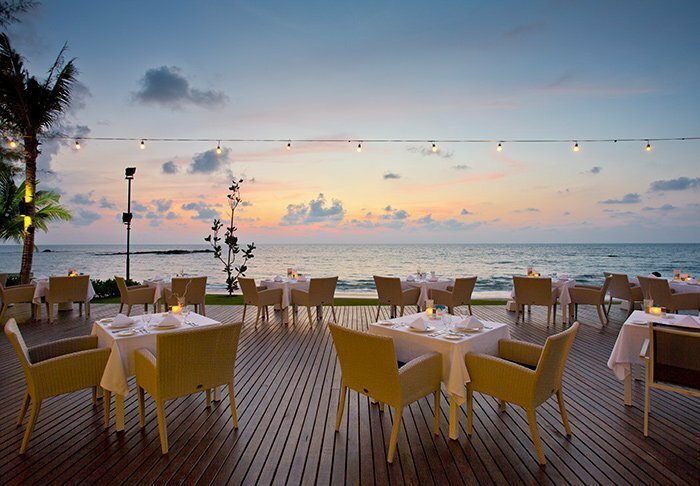 You can also book a romantic “moonlight” dinner on the beach. 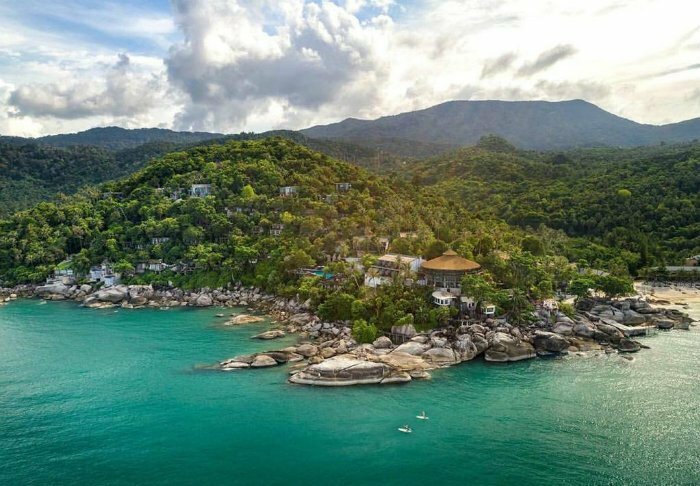 The resort also has a gym, a library and a souvenir shop, and it is possible to book excursions to Koh Tao, among other places. 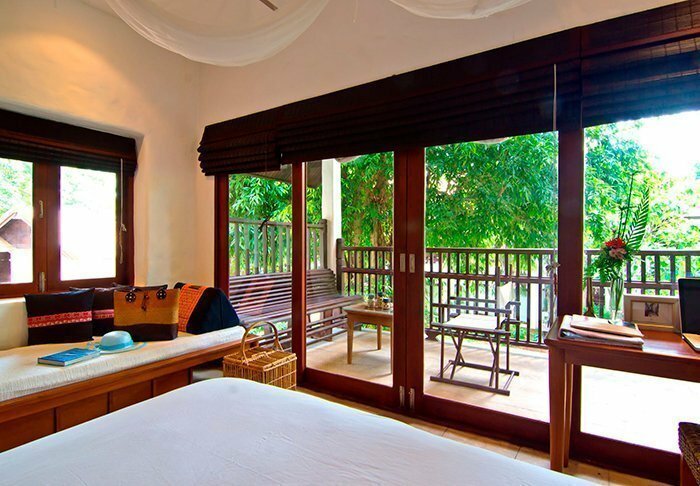 It is also worth mentioning that Santhiya is an eco-friendly resort that cares deeply about sustainability. They have a wastewater plant, their own vegetable garden, and they are very conscious of the need to reduce food waste and save energy. In addition, they support different local communities. 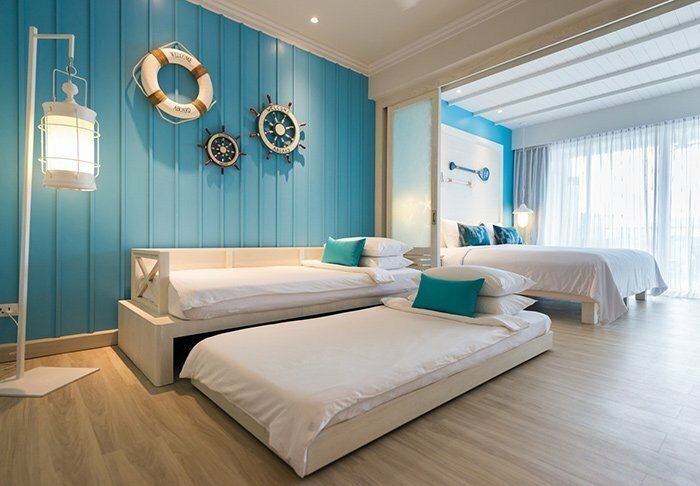 New Star Beach Resort is set in tropical surroundings by the beautiful, idyllic Chaweng Noi beach. 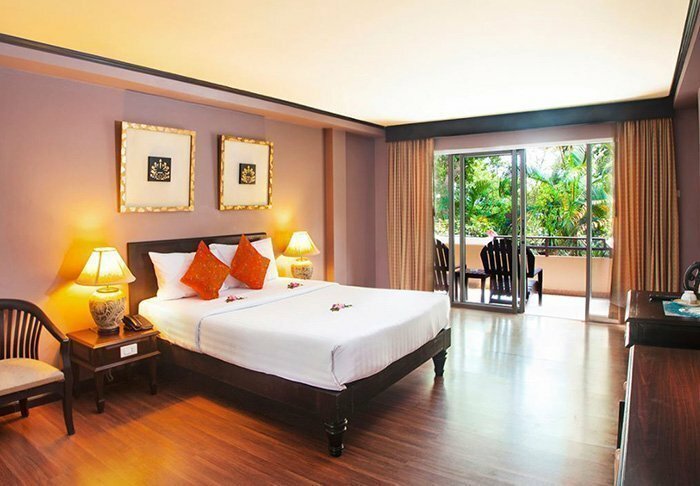 The calm is striking when you bear in mind that the vibrant Chaweng is just 2 km away. 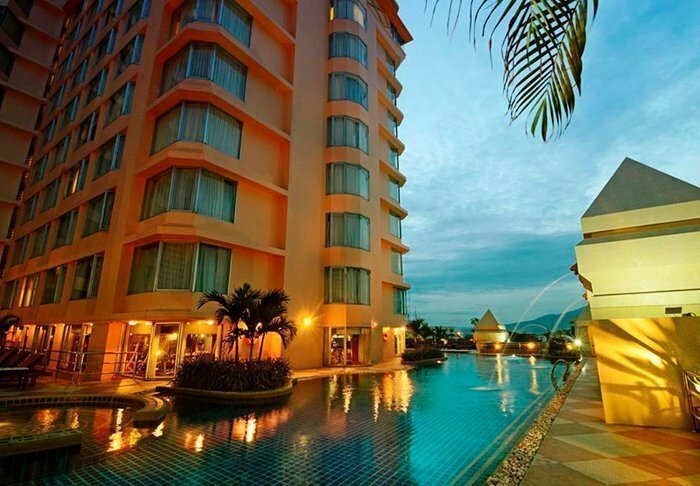 The resort has a total of 74 rooms spread throughout the hotel area. 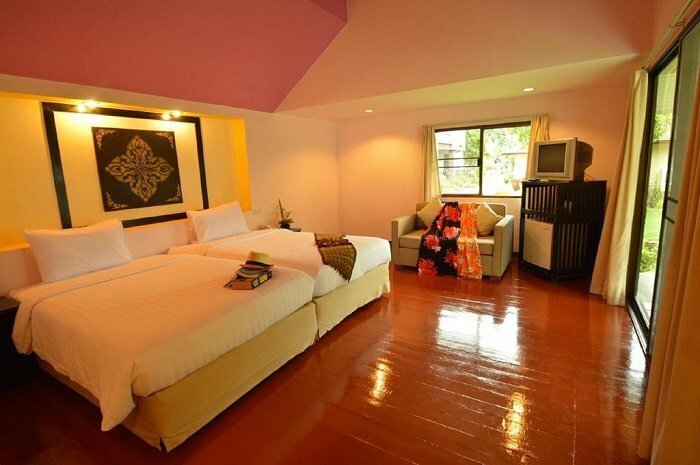 The rooms are furnished with dark wood furniture and bright colours on the walls. There is Wi-Fi, air conditioning, a safe, a minibar, coffee and tea facilities, a TV and telephone. The bathroom has both a shower and a bathtub, as well as a hair dryer and toiletries. From the balcony, you can enjoy the peaceful tropical surroundings. 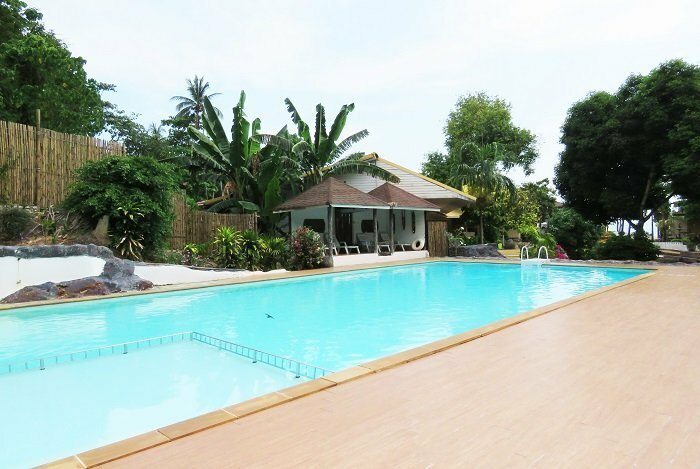 New Star Beach Resort has a lovely pool right by the 200-metre-long private beach, where various water sports activities are on offer. After a day in the sun, enjoy a spot of pampering at the Akiira Spa, which offers a range of lovely, relaxing treatments. 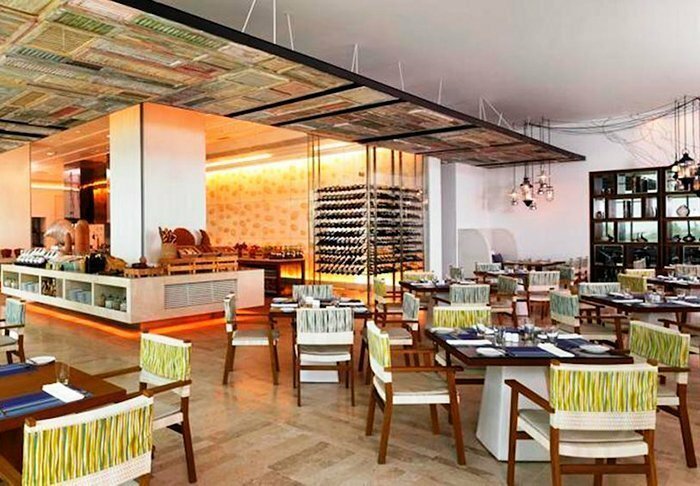 The main restaurant, “Lime – Simple & Fresh”, offers a buffet breakfast, lunch and dinner, which can be enjoyed indoors and out. 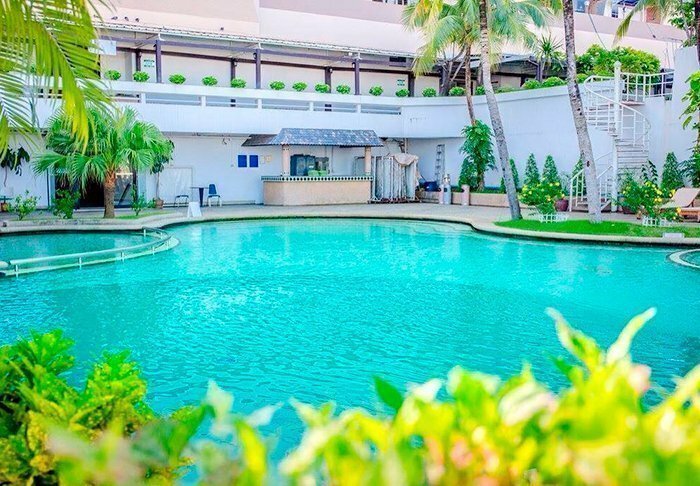 If a nice view of the pool is what you’re looking for, “Chill by the pool” is the place for you. Here, you can enjoy seafood, pizza and salads in the light breeze, and candlelit Mediterranean specialities. If you’re the romantic type, intimate dinners under the starry skies can be arranged. At the end of the day, you can enjoy a refreshing drink at the “9 degrees North” cocktail bar. If you want to explore the island, excursions can be booked at the resort. 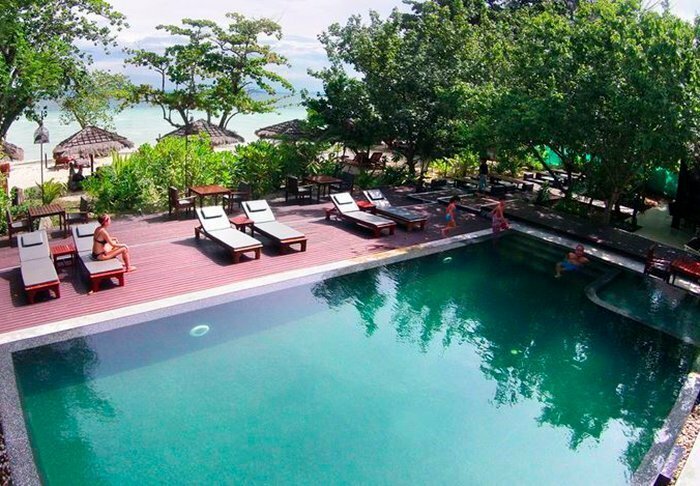 The Fair House Beach Resort & Hotel is located in a quiet, relaxed setting by the beautiful Chaweng Noi beach on the eastern side of Samui, overlooking the Gulf of Thailand. 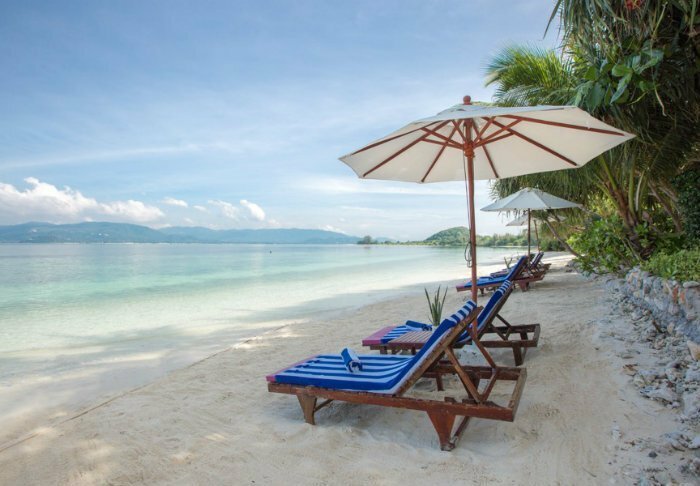 Lively Chaweng is no more than 2 km away, while several local beach restaurants can be reached in the space of a few minutes. 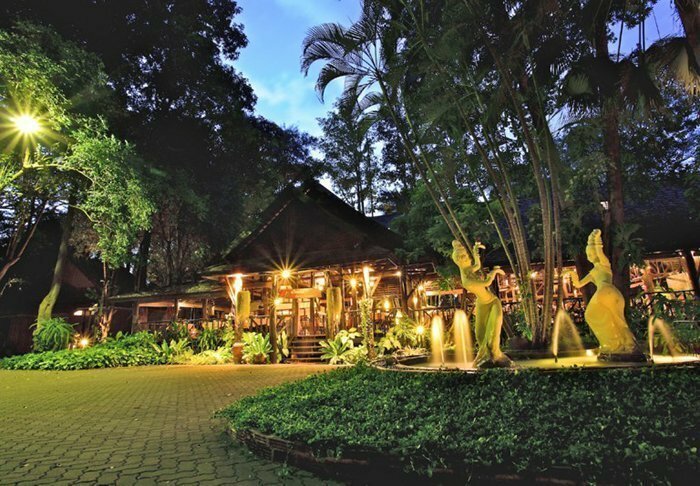 The resort’s 172 Thai-style rooms and bungalows are surrounded by lush gardens with tropical plants and palm trees. All of the rooms offer Wi-Fi, air conditioning, minibar, safe, tea and coffee making facilities, TV, telephone, hair dryer and a private balcony. 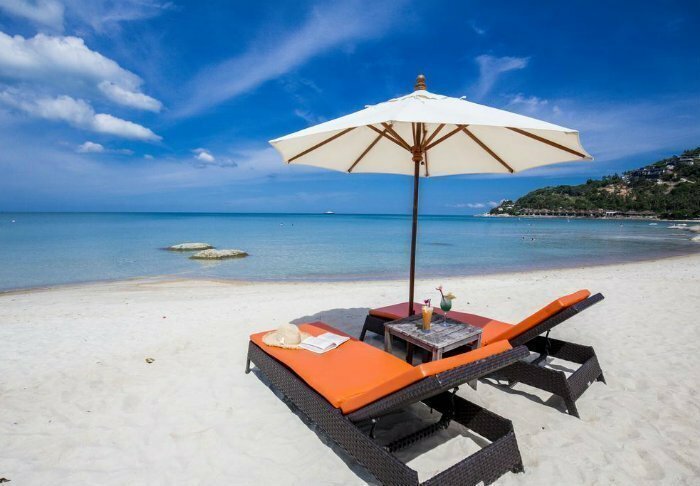 During your stay, you have access to a private beach with sun loungers and parasols, where you can laze in the baking sunshine and enjoy the beautiful view of the sea or play a game of beach volleyball. 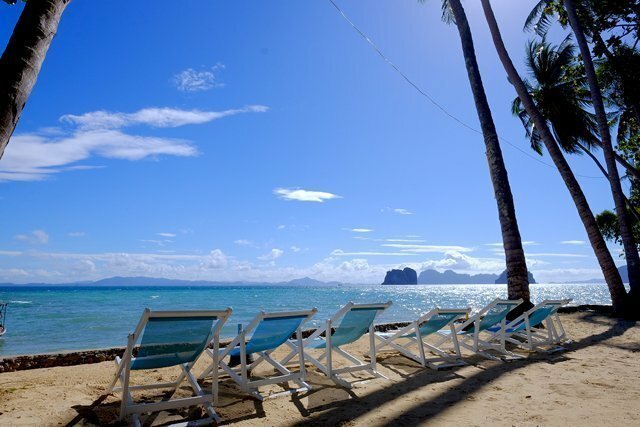 When the sun is at its highest, you can lie in the shade of a palm tree and read a good book. 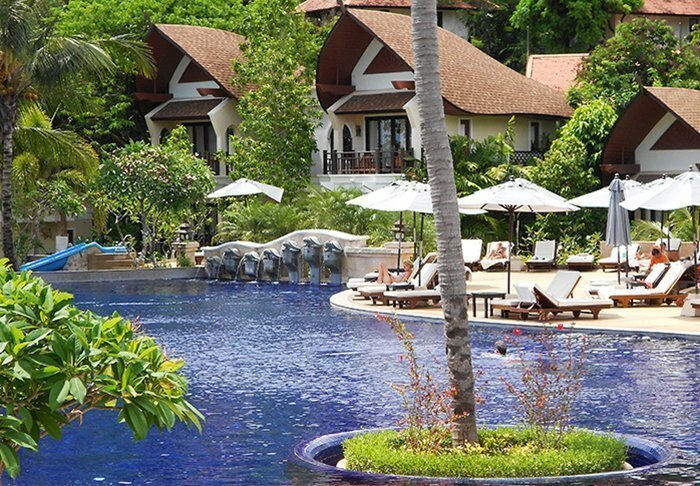 If you are more of a pool type of person, the resort has not one but two of them. 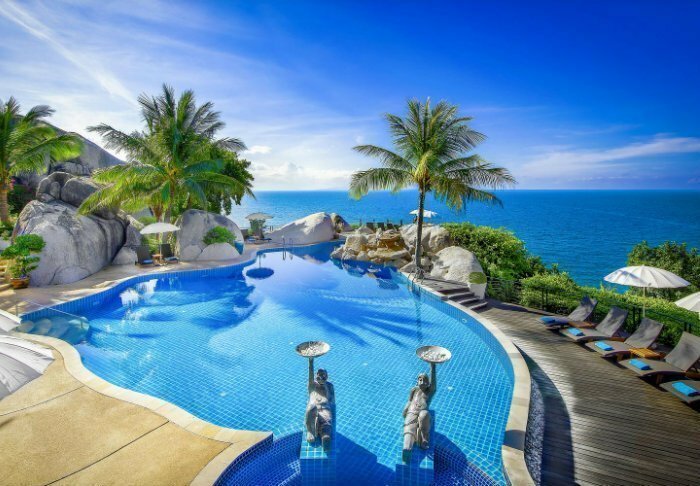 One is a freshwater pool with jacuzzi close to the beach, while the other is a tropical pool located on a hilltop. 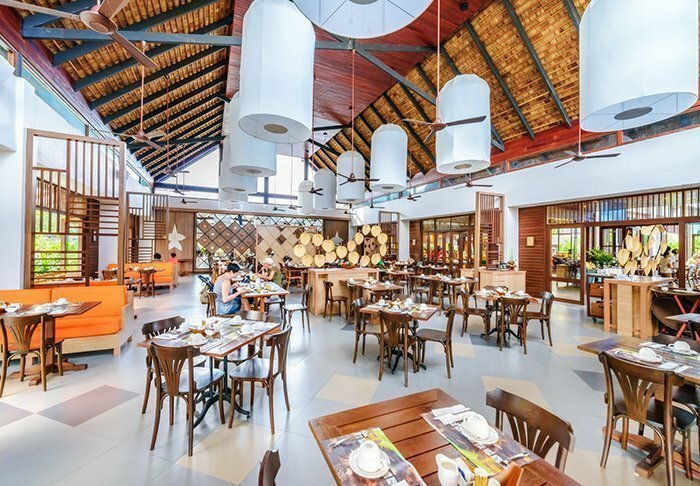 When hunger strikes, you can enjoy everything from Thai and European dishes to delicious fish and seafood grills in the beach restaurant. In the bar of the same name, you can enjoy a nice cold drink. Need a spot of pampering? Then book an appointment at Pandanus Spa for a massage or other fabulous body and facial treatments. 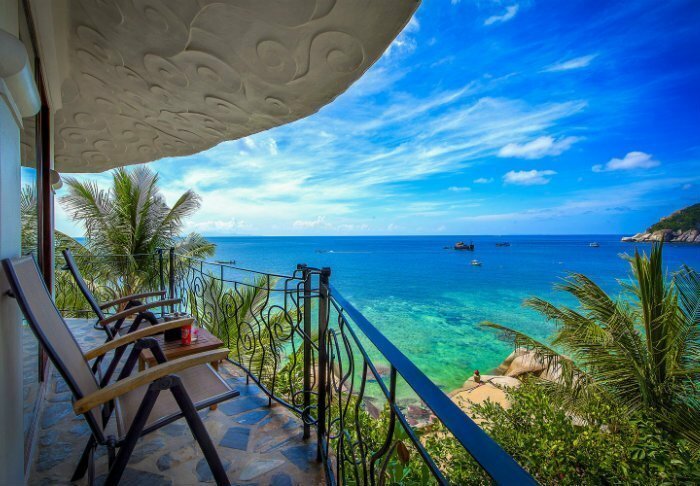 Jamahkiri Resort & Spa affords spectacular views of Thian Og Bay on the south side of Koh Tao. 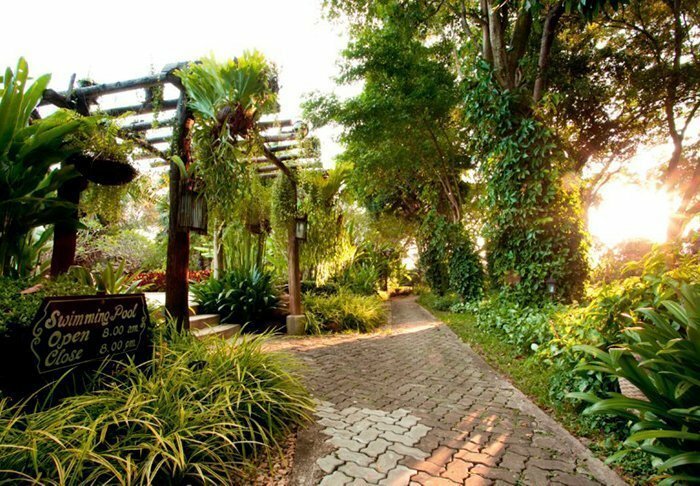 Located in a quiet area, it is surrounded by lush gardens and swaying palms. The resort is set up the cliff side with quite a lot of stairs, making it unsuitable for mobility-impaired guests. 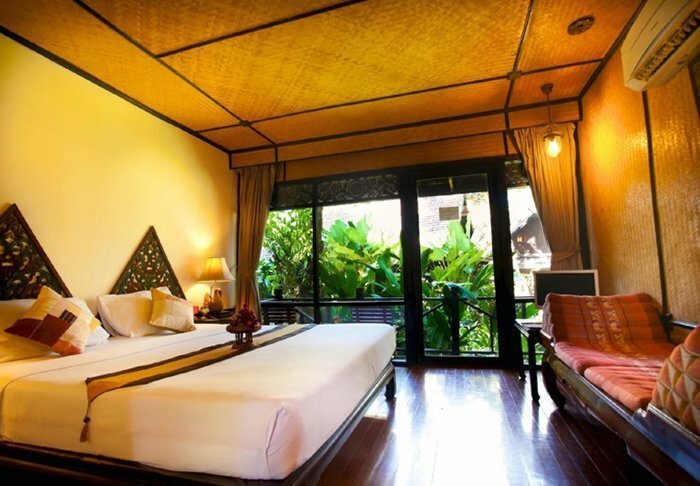 The large, spacious rooms are decorated in Thai style. 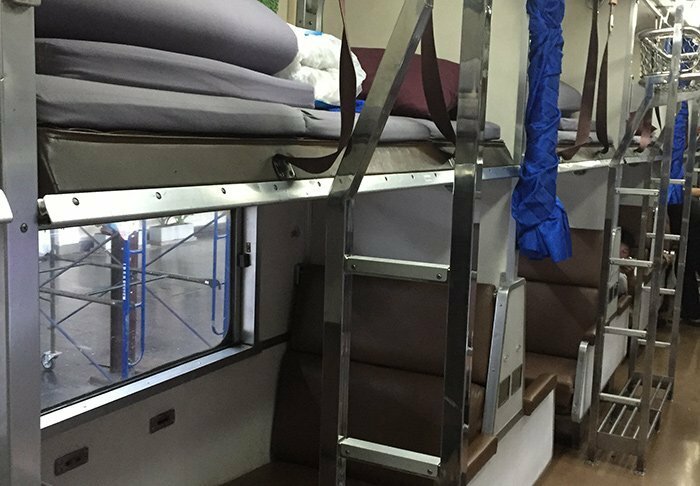 They all feature Wi-Fi, air conditioning, a mini bar, a TV, a telephone, a safe and a bathroom with a hair dryer, toiletries, bathrobes and slippers. 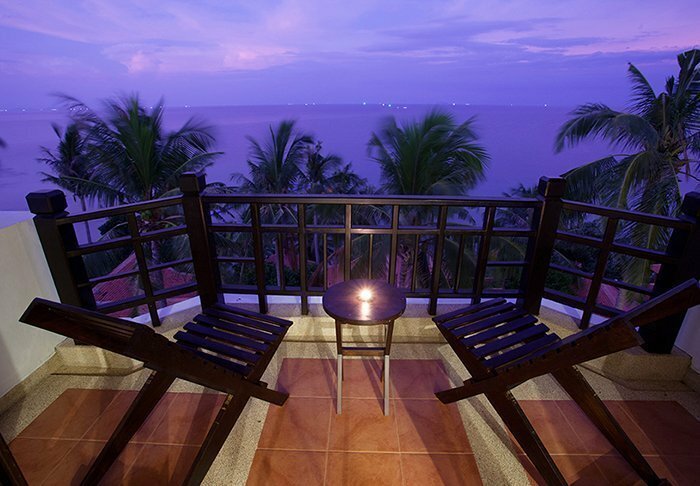 From the balcony, you can enjoy the beautiful sea view. 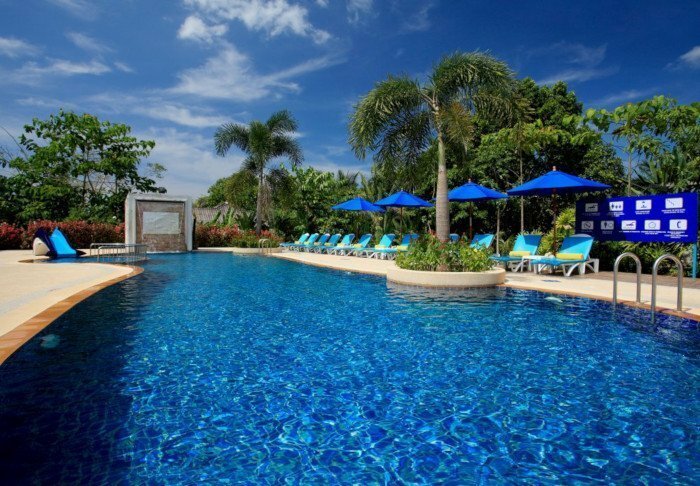 The resort has a lovely pool with a poolside bar, where lunch and drinks are served. 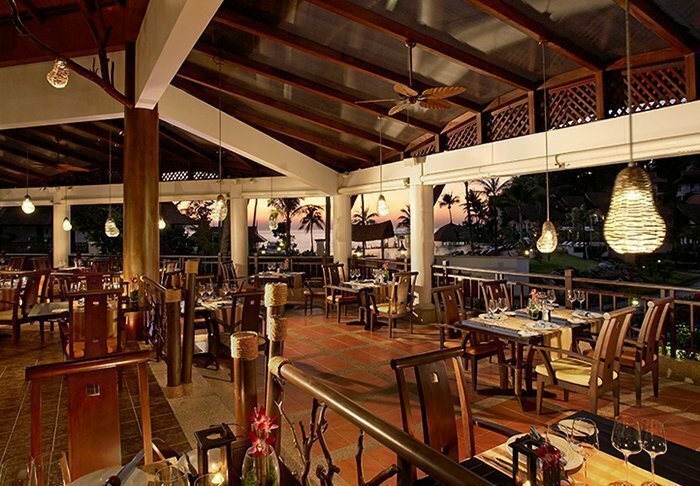 The main restaurant serves international and classic Thai dishes as well as fish and seafood. There is also a wine cellar with wines from all over the world, and a bakery selling freshly baked bread and cake. Jamahkiri has a small, private beach and amazing snorkelling and scuba diving areas. 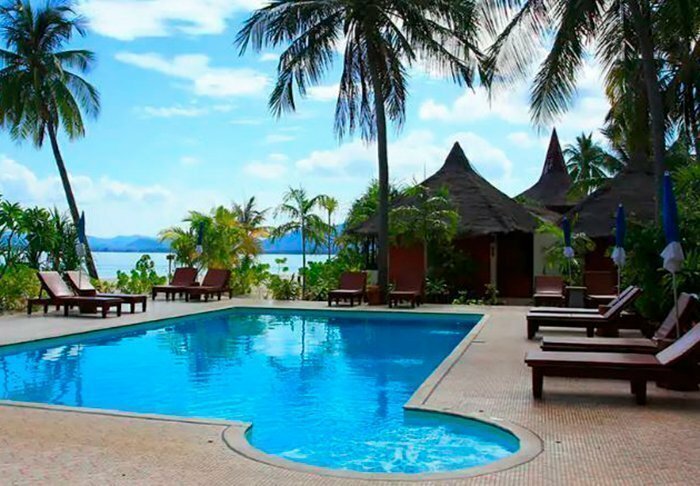 If you have not dived before, the resort has a PADI certified diving centre with skilled instructors. After a day of sun and salt water, enjoy a range of massage and facial treatments at the resort’s spa. There is a gym for active guests. 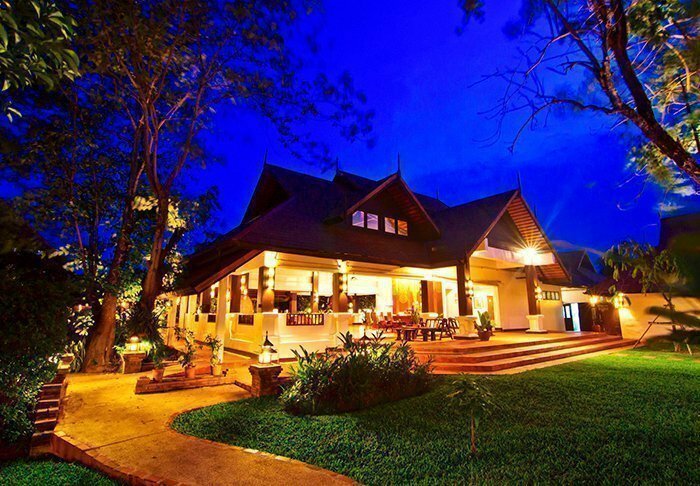 This gorgeous lodge, built in the characteristic Lanna construction style, can be found at the banks of the Wang river. Bungalows are spread out across a large garden, and water lilies float in the garden’s little lake. Here you find yourself in the middle of nature, yet still in great comfort, and the hotel is perfect for a few days’ relaxation with walks, a good book, or a cycling trip to one of the nearby villages. The hotel has a pool with a view of the river, two restaurants and free internet. 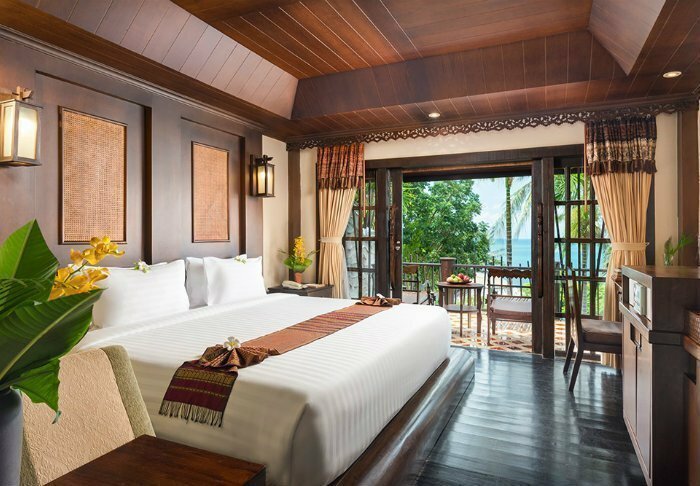 The rooms are reasonably spacious and feature a rustic, wooden interior, suited to the building style. All the rooms have their own bathroom, air conditioning, tea and coffee facilities, TV, Wi-Fi and hair dryer. 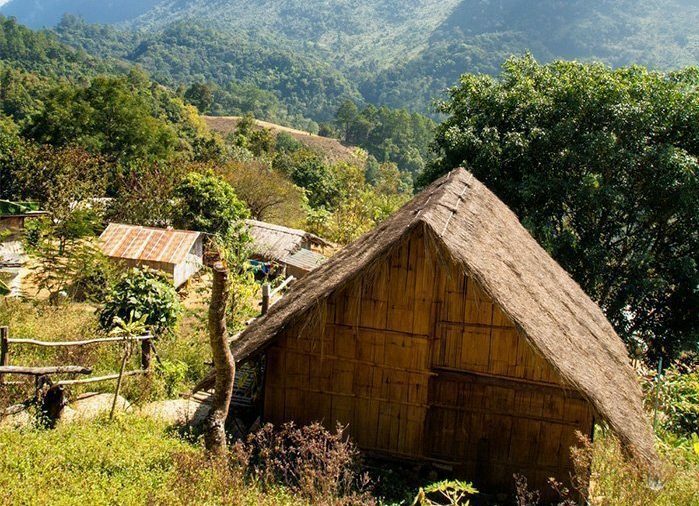 You will even spend the night in one of these mountain villages, sleeping in a primitive bedroom-like room. 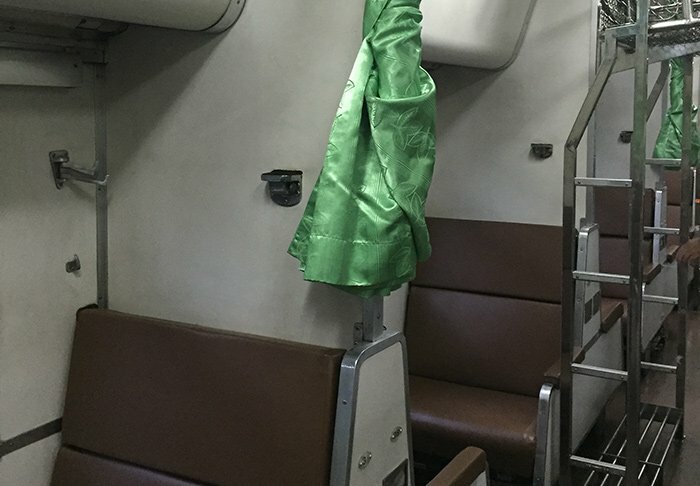 There is no air conditioning, no western toilet or bathroom facilities, no Wi-Fi, no electrical power – just a mattress on the floor with a pillow and a blanket, surrounded by a mosquito net. Other than that, nothing. 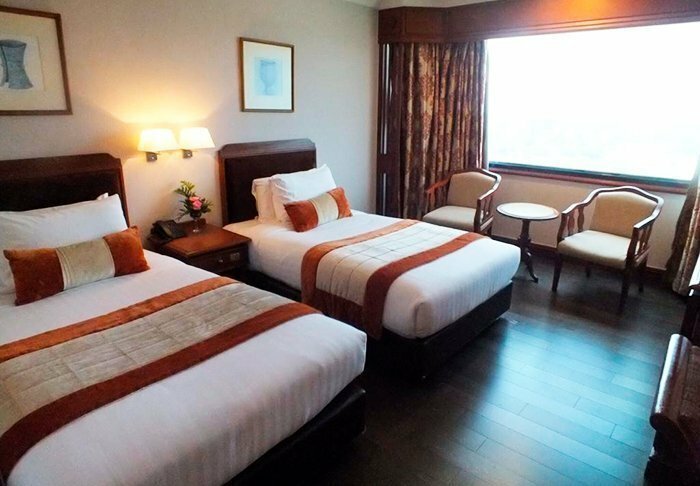 The 3-star Topland Hotel & Convention Centre is located at the centre of Phitsanulok. The hotel is connected to a shopping centre with direct access from the hotel. 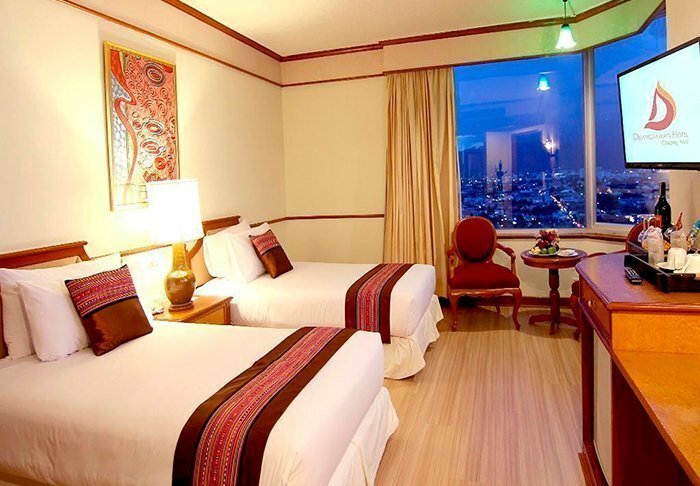 Most of the rooms offer an excellent view of either the city or the river. 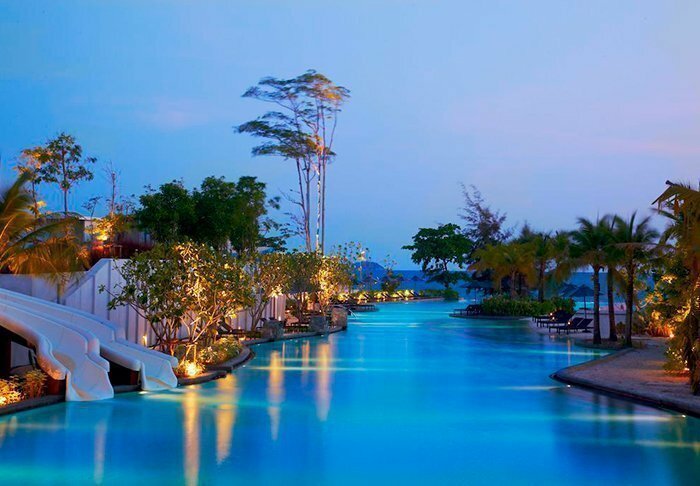 The hotel has a small pool, a spa area, and several restaurants. 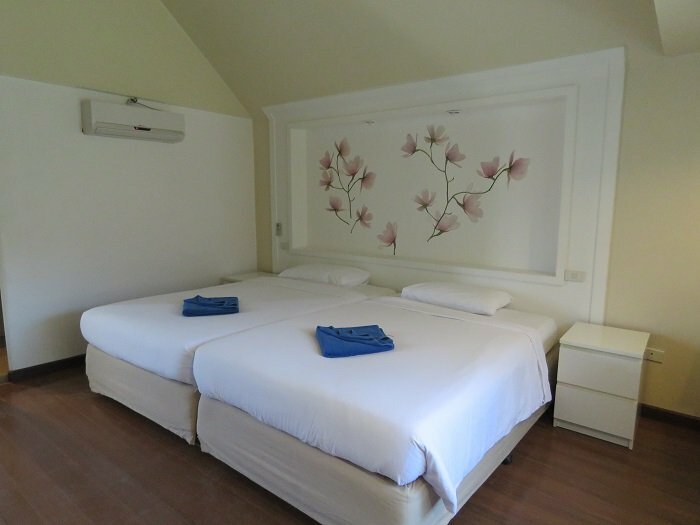 The rooms are spacious, and feature a TV, safe, air conditioning, minibar, tea and coffee facilities and a refrigerator. Free Wi-Fi is available at the hotel (limited by time). 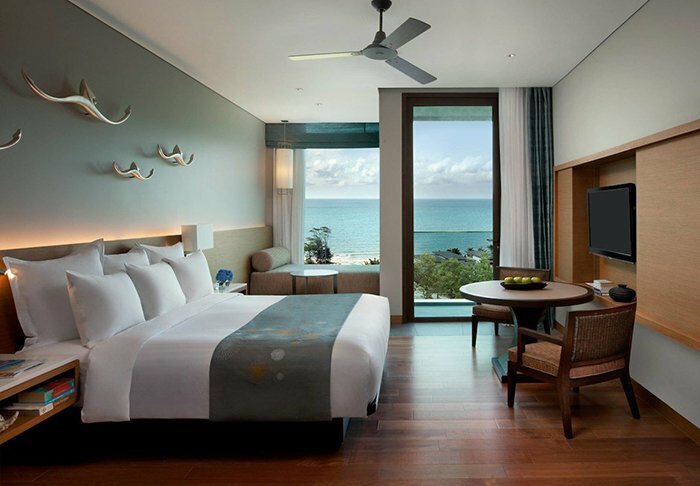 This luxurious 5-star hotel is located on the Wang Kaew beach in Rayong, 15 km from the small town of Ban Phe. The hotel is 11 storeys high, and features 205 rooms, each facing either the mountains behind the hotel or out towards the sea. 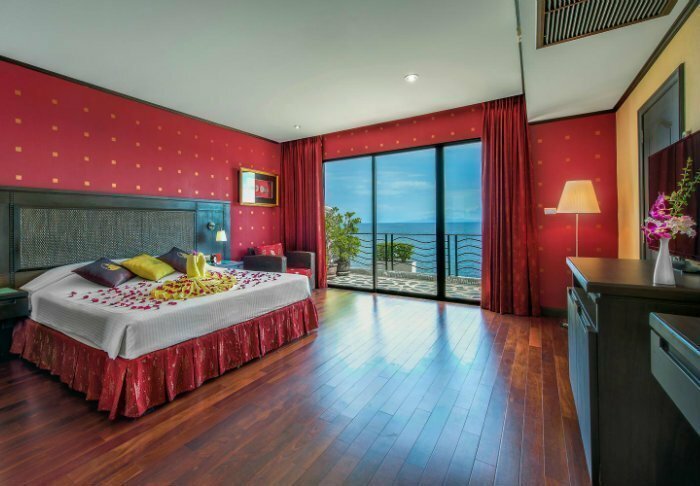 The rooms are spacious and feature modern interiors with sound-insulated windows and private balconies, from which you can enjoy the sea view and its serenity. 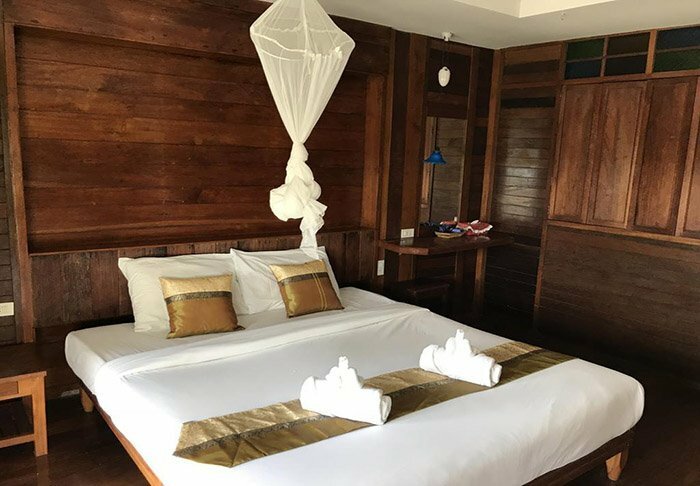 All rooms are equipped with Wi-Fi, air conditioning, safes, a minibar, tea and coffee facilities, TVs, irons, as well as bath robes and slippers. At the Marriot, you can also choose your own duvet and pillow. 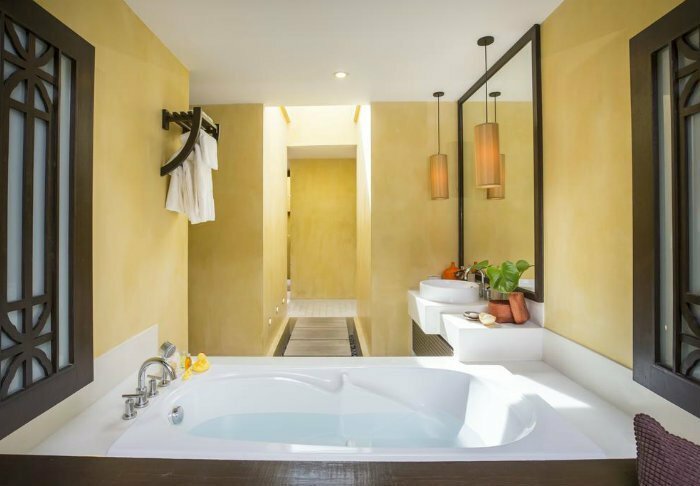 The extravagant bathrooms feature separate showers and bathtubs, and the room’s walls can slide. 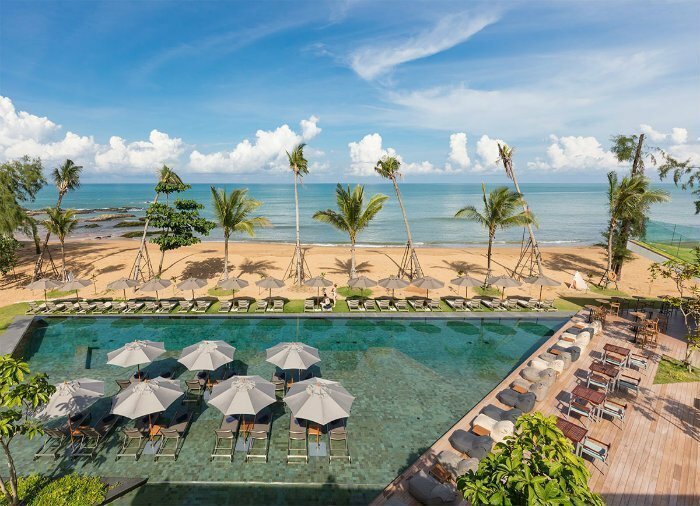 Marriott has two swimming pools, one gigantic with a connected sandy beach, and the other with the beach nearby. Whichever one you choose, you can feel comfortable as you lean back and unwind. 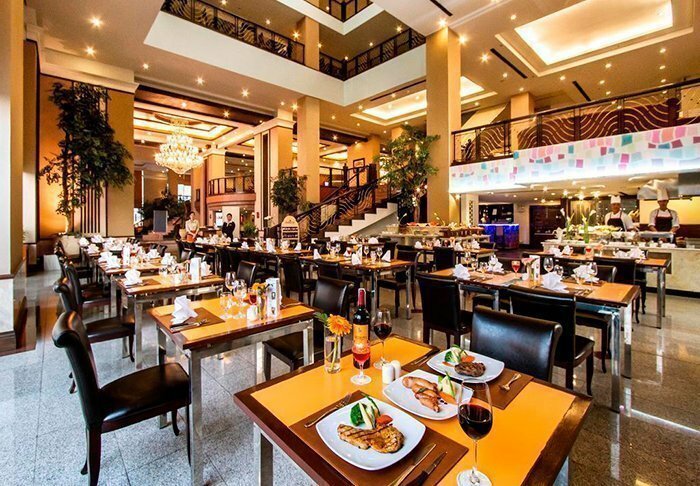 The hotel also has several hotels and bars – at C-Salt you can enjoy international buffet dishes, and at Fish Bar, you can enjoy fish and shellfish dishes. The lounge, the bar Water and Java+ serve a wide selection of drinks and snacks. Additional facilities include a children’s club, a fitness room and a spa area. Excursions can be arranged at the tour desk. 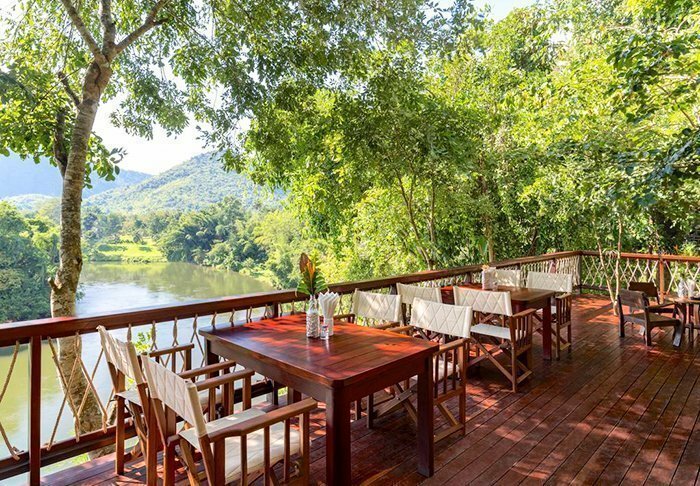 Hin Tok River Camp is situated on the banks of the River Kwai, where the only other footsteps you will see are from the local farmers, birds and animals. The camp itself is positioned close to the hiking trail to Hell Fire Pass. 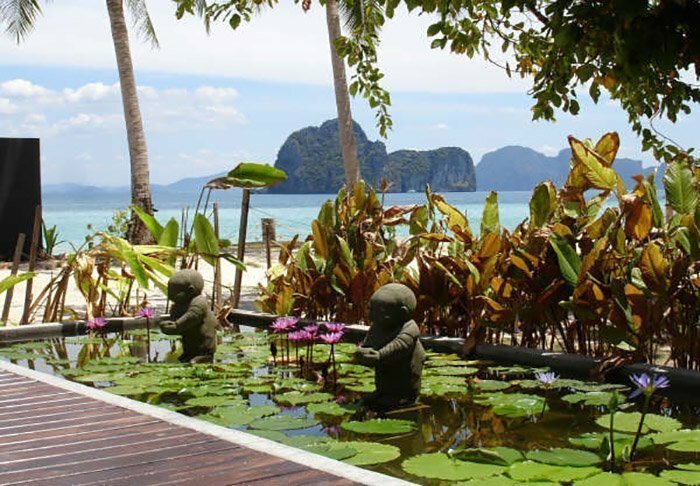 It is without doubt one of the most beautiful and idyllic locations in Thailand. 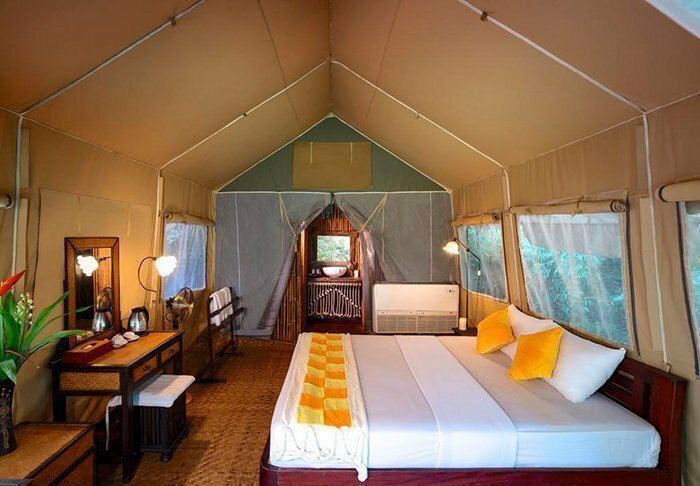 The camp comprises 38 luxury tents (26–32 m²), all with their own bathroom and veranda. 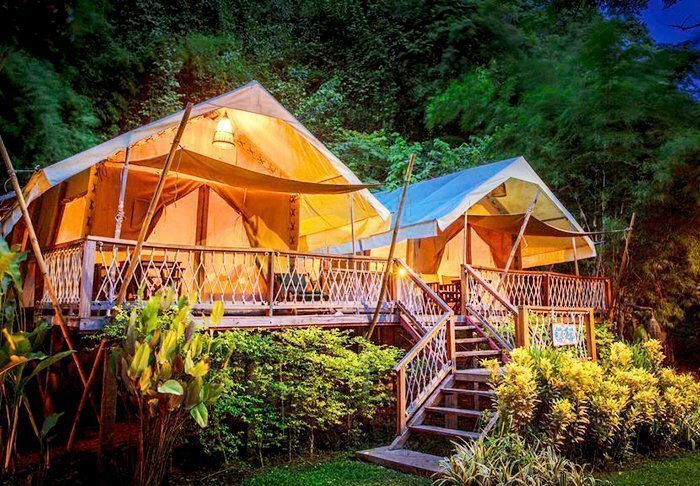 All the tents stand on a platform raised half a metre above the ground, and all are fitted out in safari style. A large green lawn separates the tents from the river. 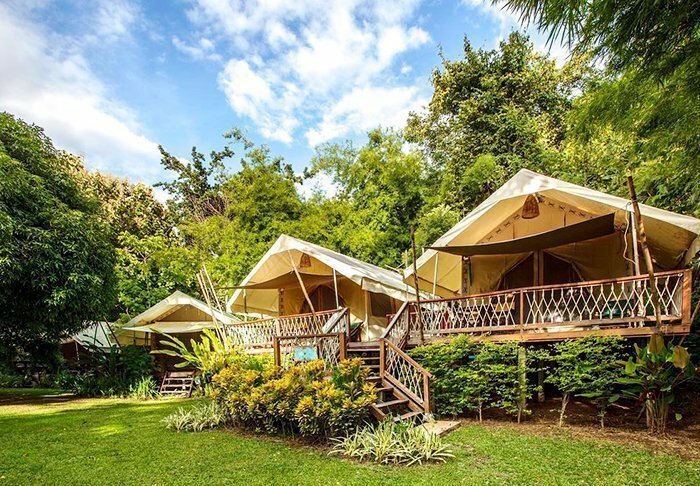 The tents are equipped with proper beds, air conditioning or fans, and a refrigerator. 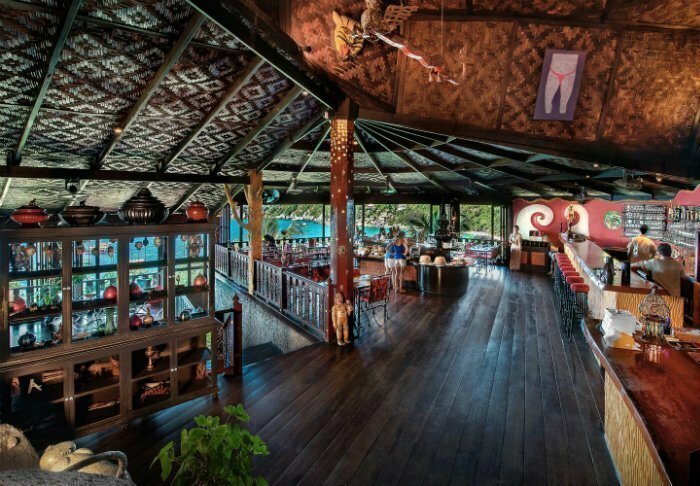 After 22.00, guests are requested to keep quiet – this means no loud music, just the noises of the jungle. 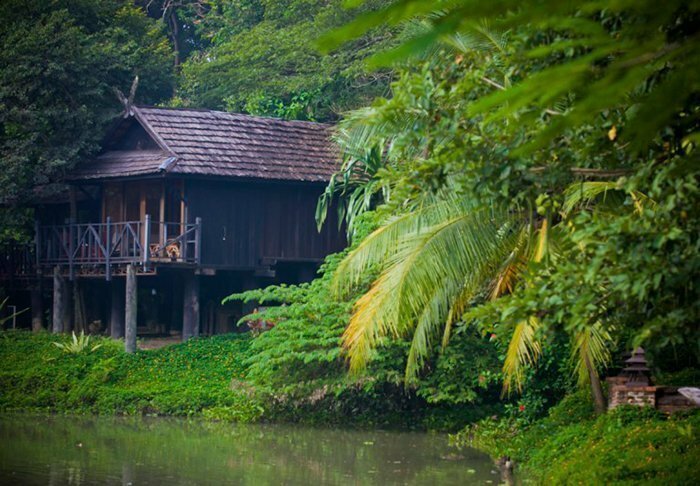 It is almost an authentic ‘Out of Africa’ experience – only in Thailand. 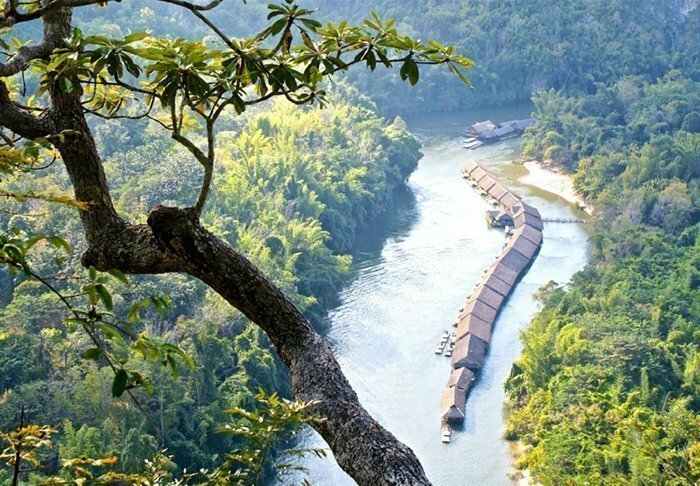 The unique River Kwai Jungle Rafts installation is a ‘flotel’, i.e. 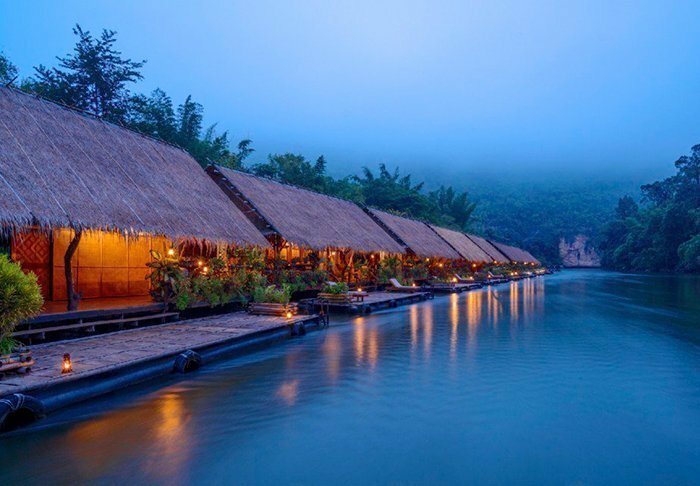 a hotel built on a raft, which is sure to redefine your perception of luxury. 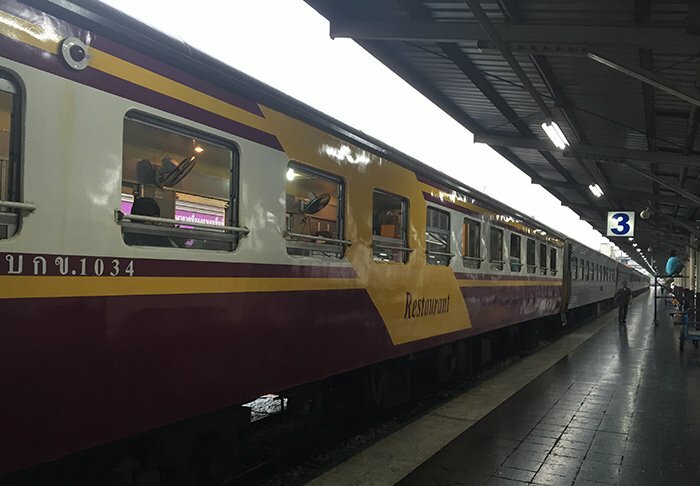 The flotel is permanently moored on the River Kwai, linked to the banks by a gangway. 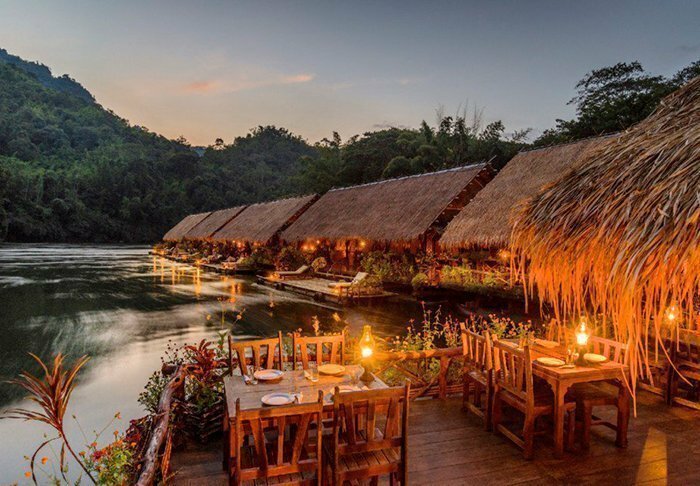 >From the seating areas, you can look out over the river, the giant bamboo on the banks, and the wild orchids growing in the forked branches of the trees. Just a short distance from the hotel stands an ethnic ‘Mon’ village, that you are welcome to visit. The Mon people originally stem from Myanmar, and many Mon men work as mahouts, which explains why you will see elephants in the village. 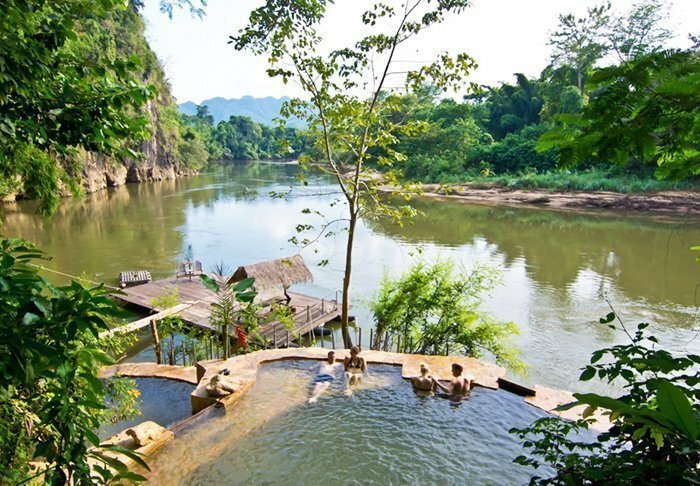 You can also go canoeing on the river, try your hand at fishing, take a refreshing swim, relax in the sun or explore the nearby grottoes. 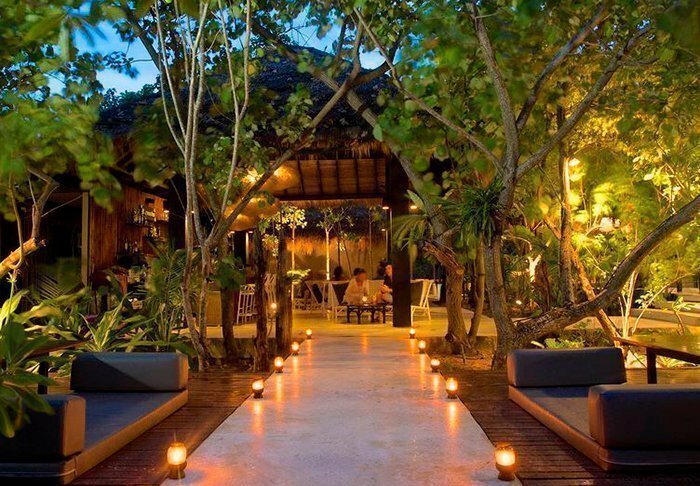 When the velvet tropical night sinks over the landscape, the jungle sounds become magical and a romantic mood sets in. The cicadas start to chirp, someone in the village begins to play traditional music, and the water gurgles beneath the flotel, which is illuminated exclusively by oil lamps. The hotel features two sections and a total of 100 rooms which are sparsely furnished, with no electricity, no TV, no minibar and no Wi-Fi. 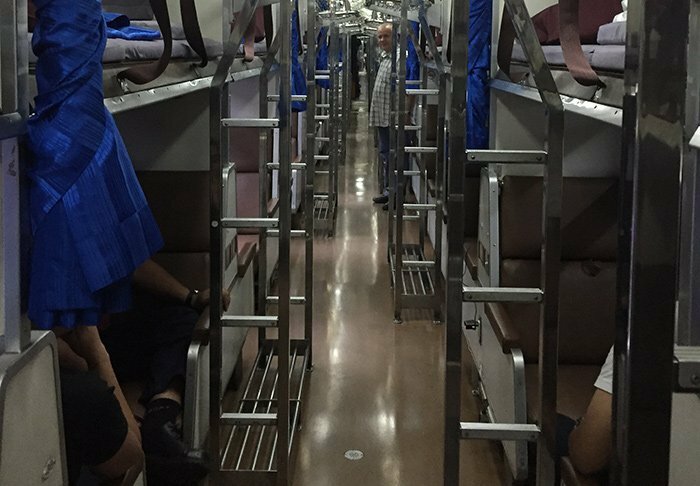 The bathroom and toilet facilities are very simple, too, and there is only cold water in the shower. 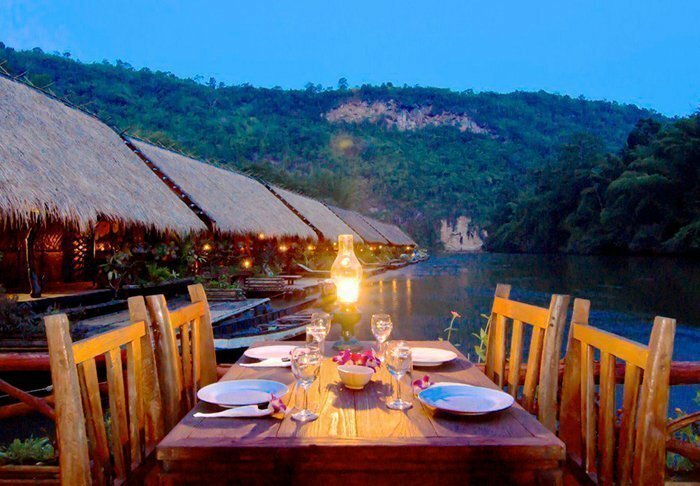 A stay at River Kwai Jungle Rafts is a ‘back to basics’ experience to cherish for a lifetime!